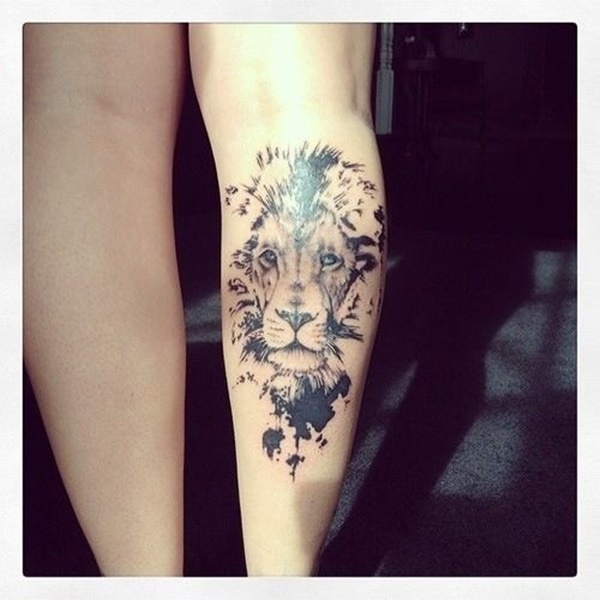 Lions are majestic creatures that represent dominion, confidence, ferocity, and power. 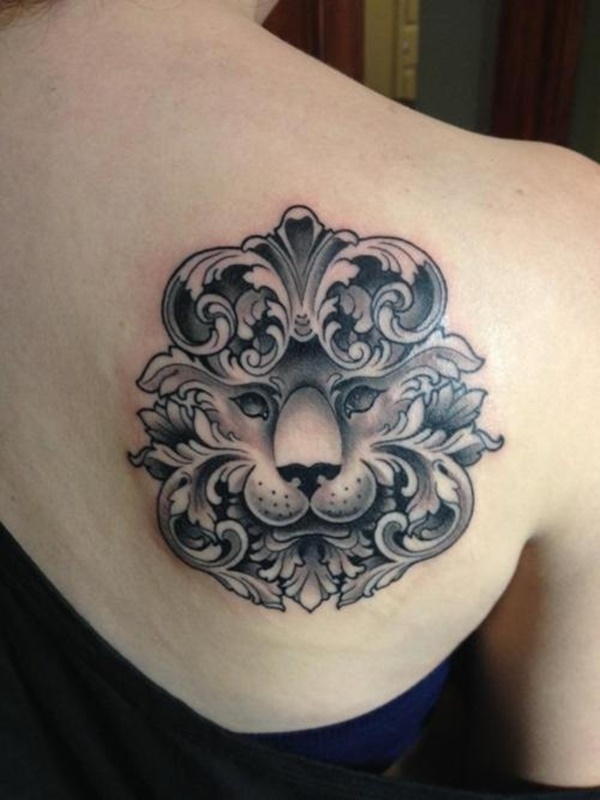 The image of lions also conveys bravery, protection, strength, and wisdom. 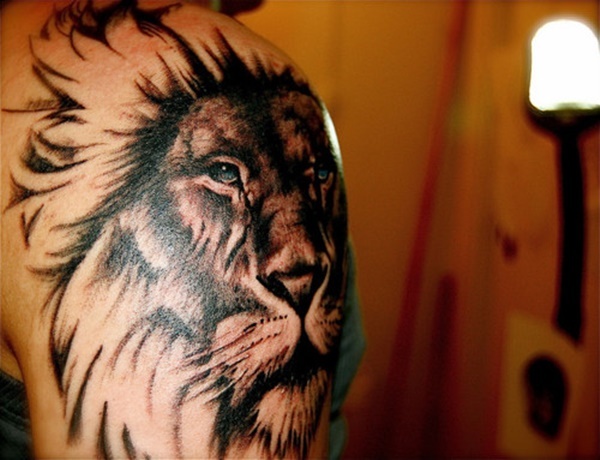 In the ancient times, lion tattoos symbolized the valor of fierce warriors and authority of leaders. 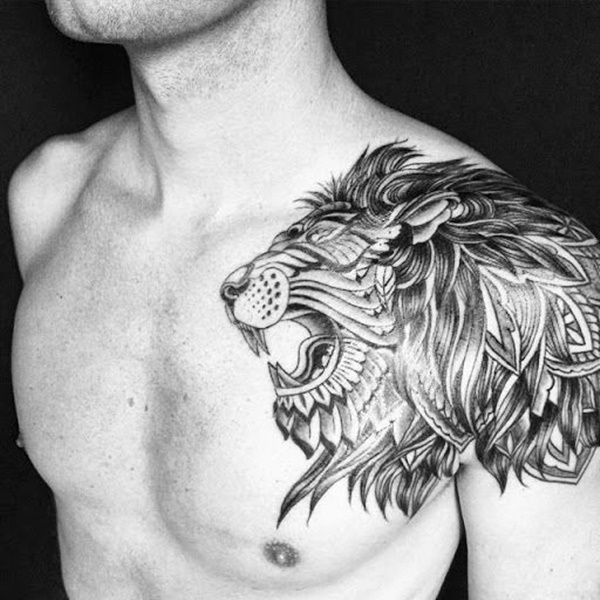 From Africa and Egypt to China and various parts of Asia, lion tattoos have been used for centuries as symbols of supreme power and royalty. 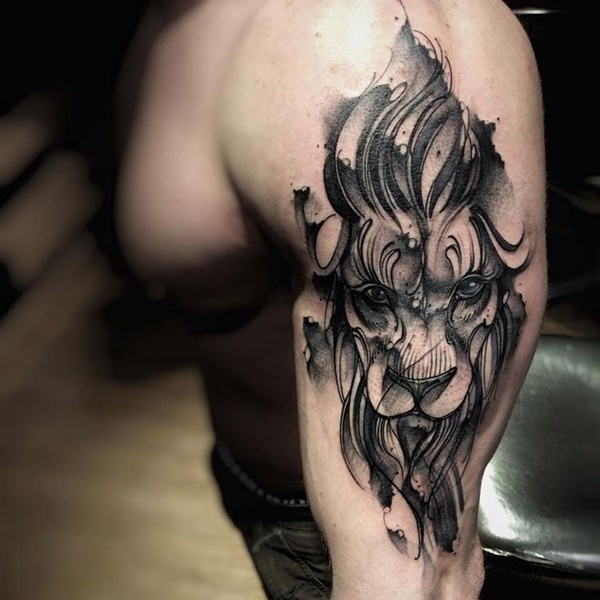 If you’ve been thinking about getting a tattoo that portrays your strong character and wild nature, a lion tattoo is an excellent choice. 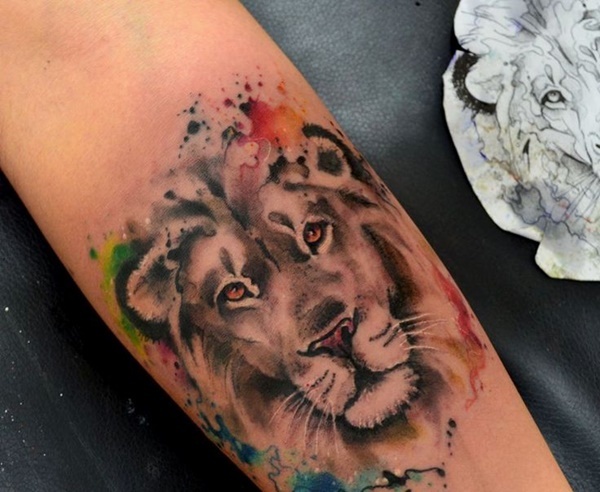 Consider the following collection of artistic lion tattoos to get amazing design ideas. 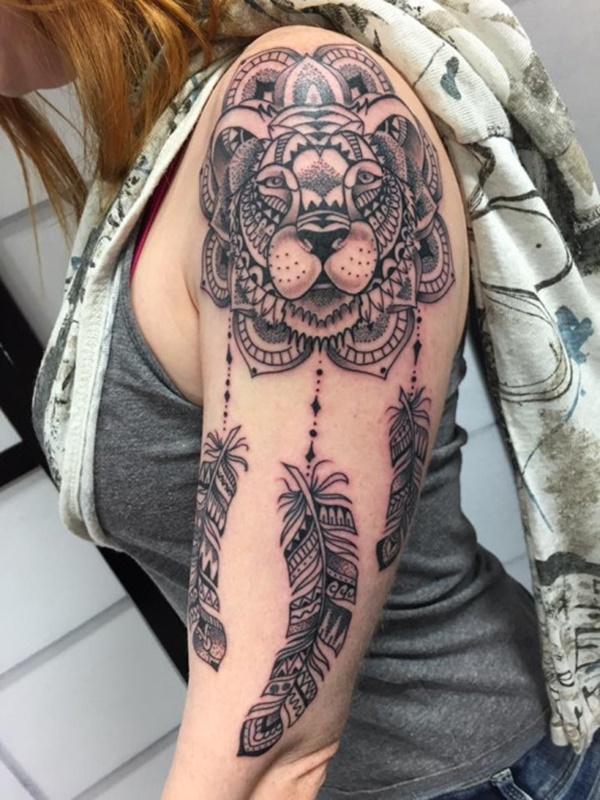 Whether you want an attention-grabbing tattoo or a simplistic expression, there’s surely something here to pique your interest. 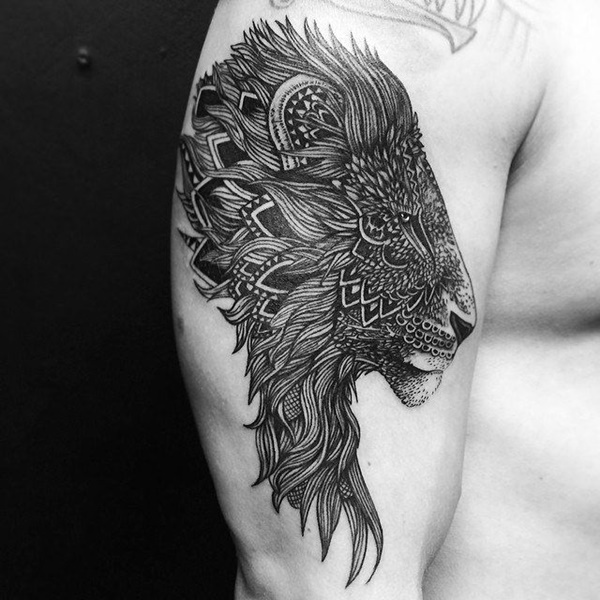 This captivating tattoo features the head of a lion linked to three feathers down the upper arm. 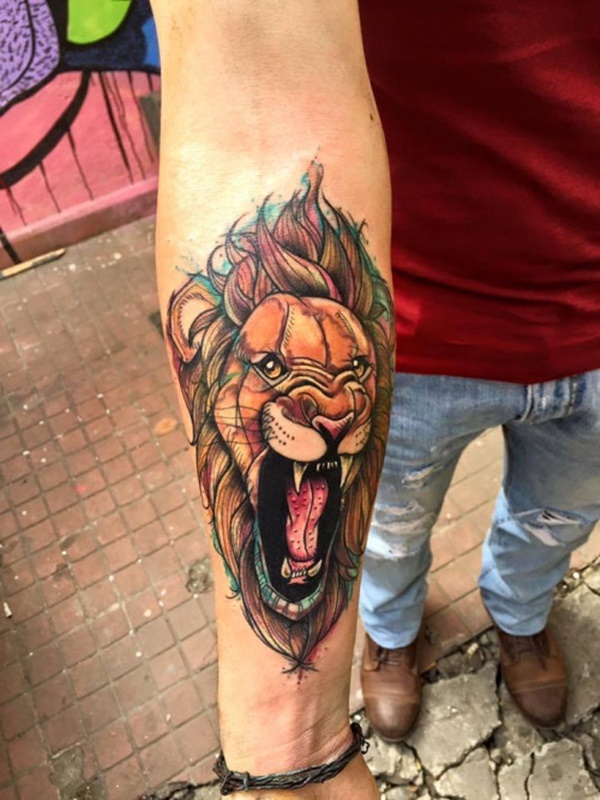 If you’re not afraid to show off your passionate, adventurous nature, gives this conspicuous arm tattoo a try. 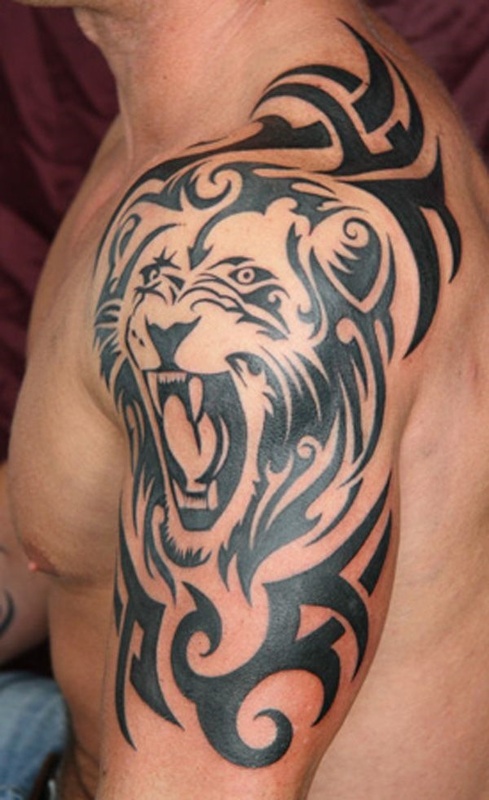 A sleeve tattoo usually covers the entire arm, from the wrist to the shoulder. Truly for the bold, confident individual, this arm sleeve tattoo displays a wonderful combination of various elements of Mother Nature, including a butterfly, a bird, and flowers. 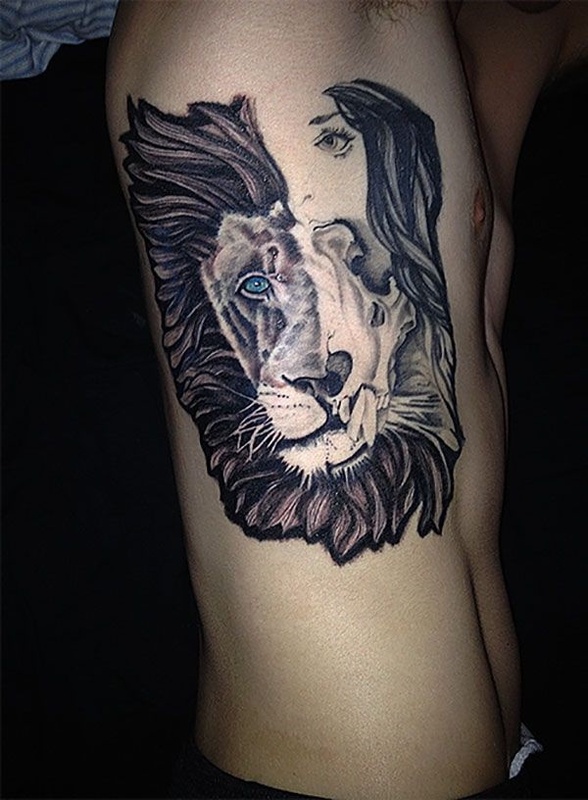 An open-mouthed leopard perfectly complements the lion head on the woman’s abdomen. 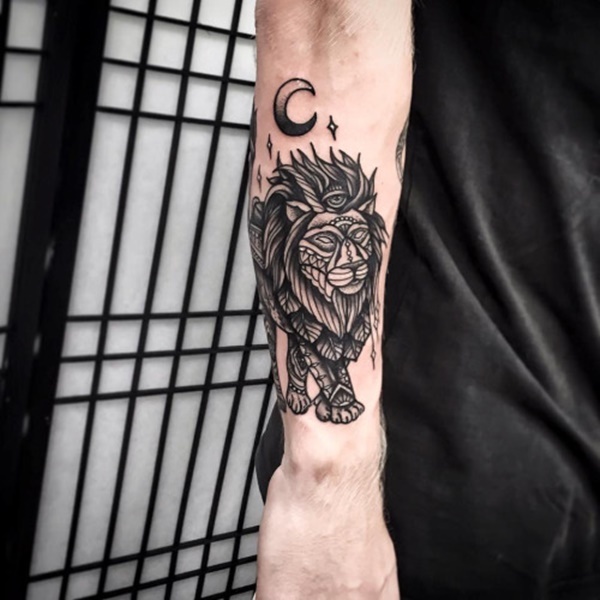 A mystifying lion casually strolling under the bright moon and stars depicts a certain calmness and adds a mysterious appeal to your personality. 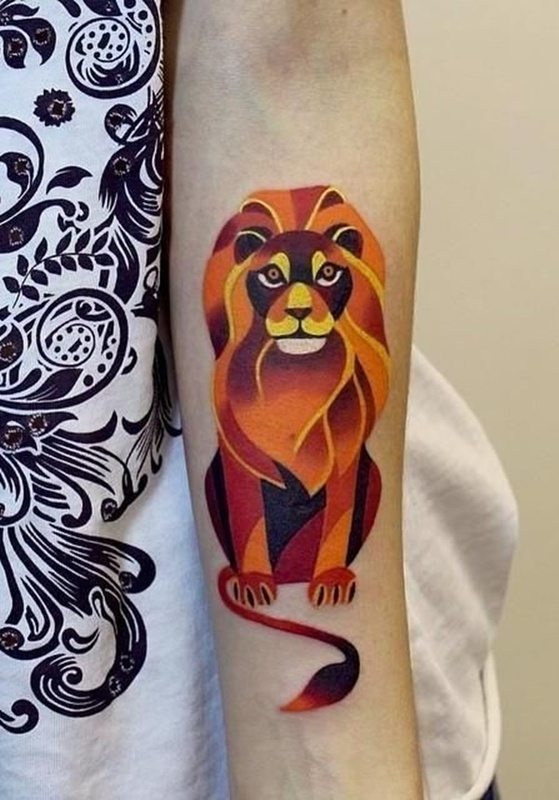 Instead of the traditional black and gray style, go for an eye-catching orange color palette to fully express the beauty of a superior, powerful lion. 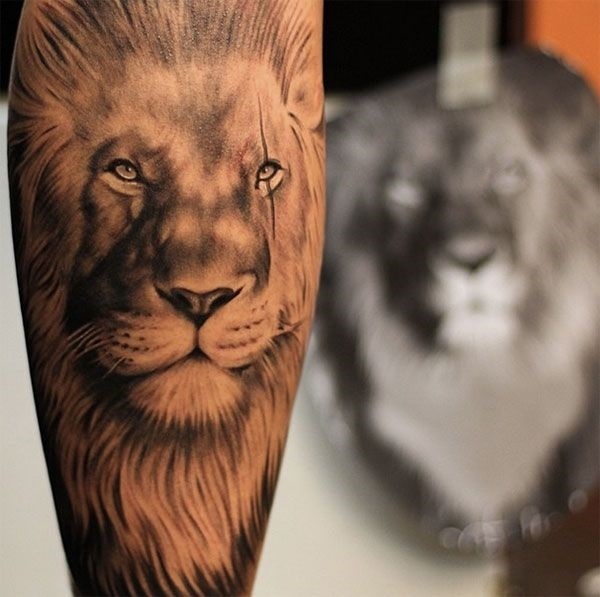 The eyes of the lion on this arm tattoo pulls you in, as if in a trance. 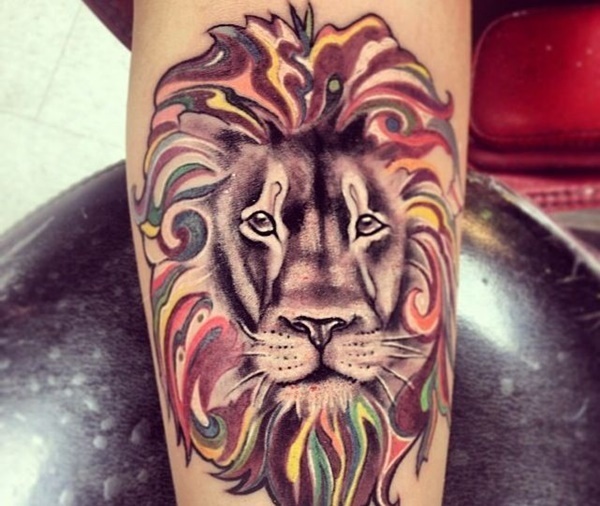 This forearm tattoo depicts a colorful design that gives off a sense of superiority and creativity. 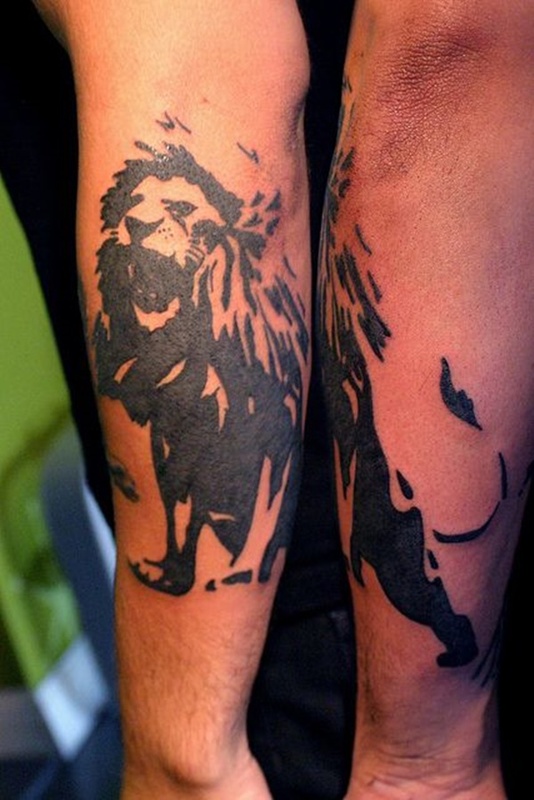 Do you want a lion tattoo that’s both artistic and simplistic? 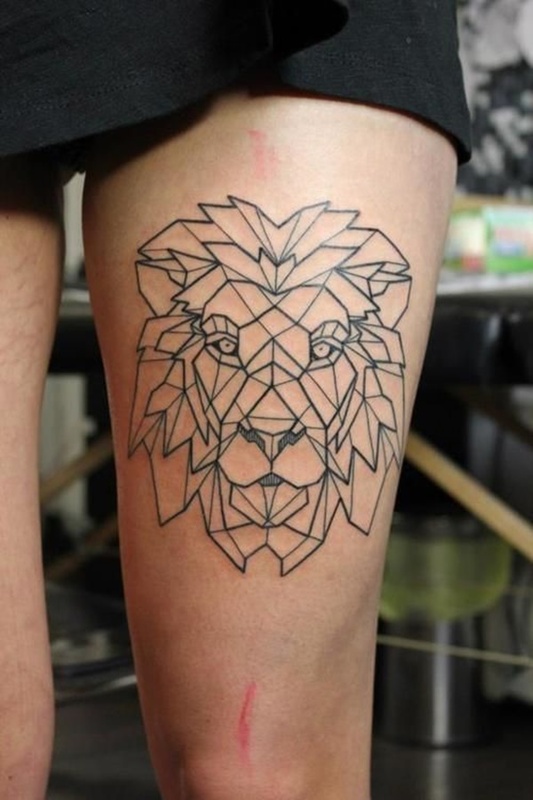 This tattoo is a great choice, as it uses geometric lines and shapes instead of shading for a clean look. 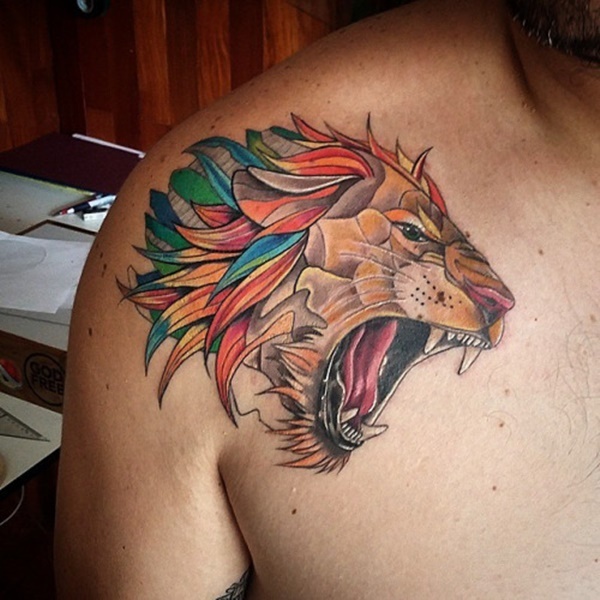 This growling lion tattoo boasts warm colors that look pleasing to the eye. 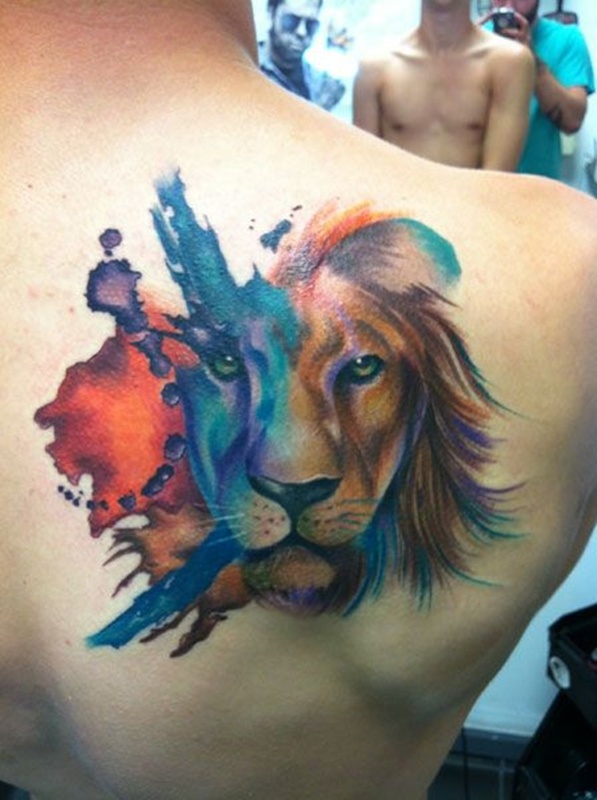 A great combination of orange, brown, red, blue, and green hues make this tattoo easily stand out. 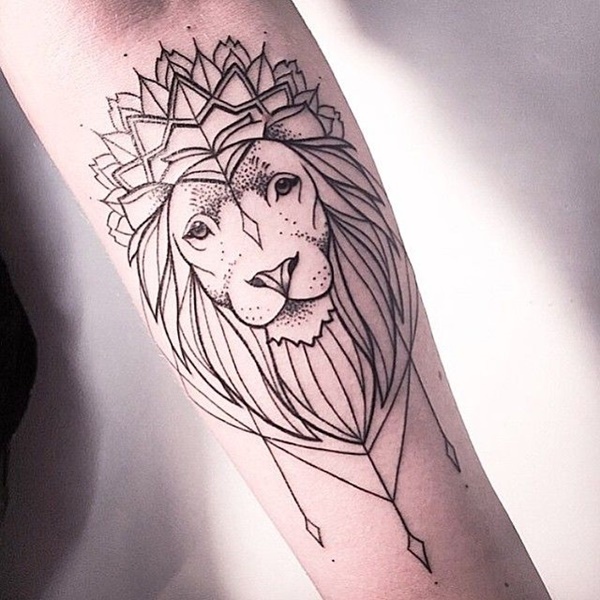 If you want a more somber depiction of your favorite animal, get a tattoo with thick lines that are filled in with black. Look into the eyes of this lion, and you’ll see a wise, respected creature worthy of reverence. 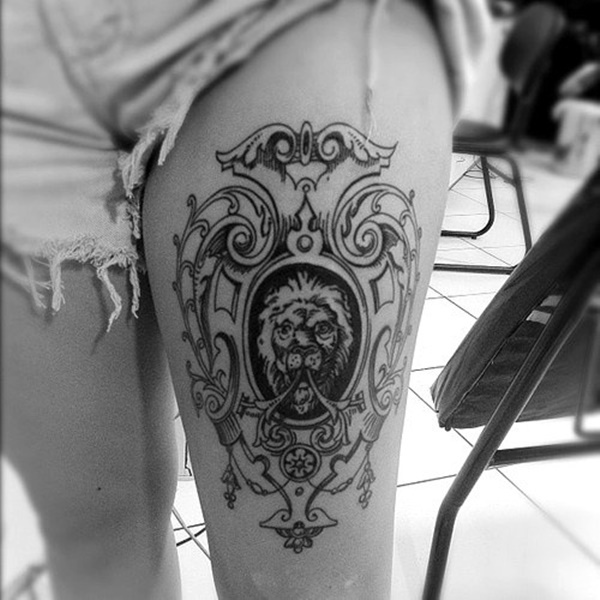 A tattoo on the thigh almost always looks seductive and somehow increases a woman’s appeal. 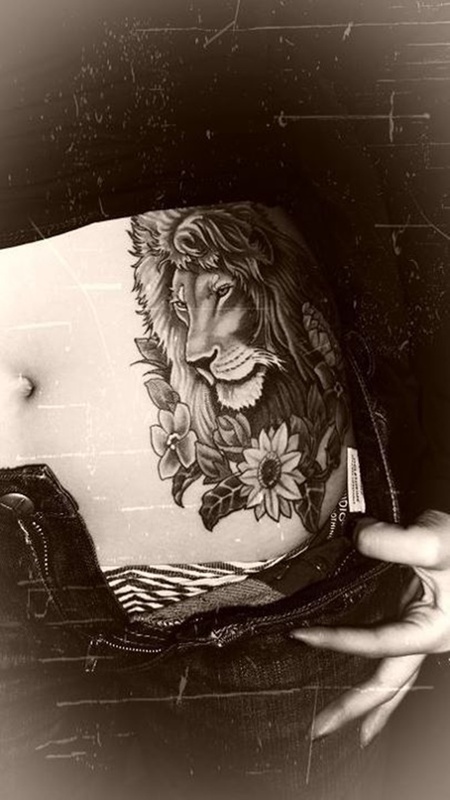 This lion tattoo is surrounded by outlines of flowers for a touch of femininity. 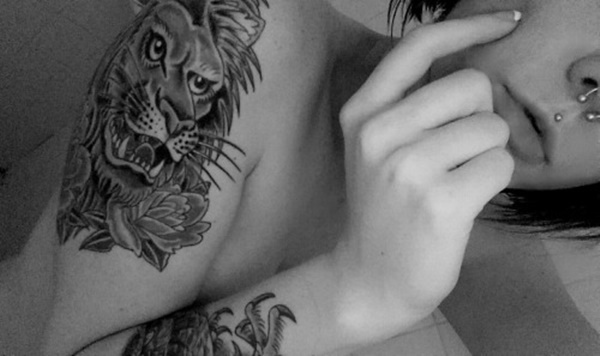 Getting a tattoo doesn’t always mean you have to show it on the most visible parts of your body. 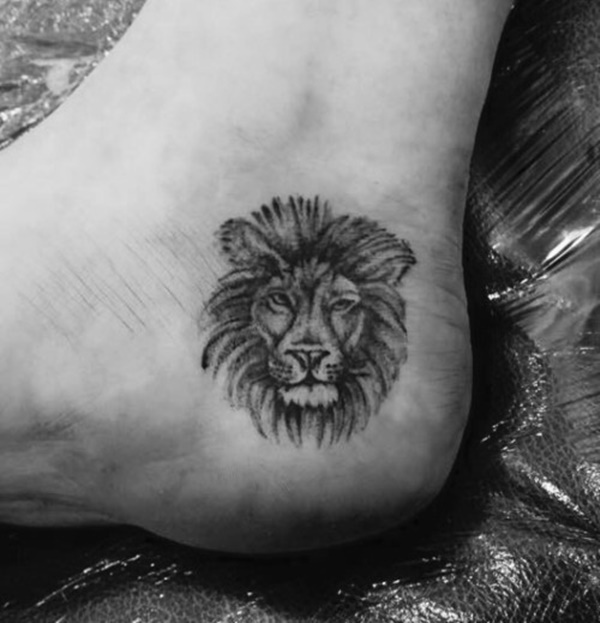 This simple side-ankle lion tattoo features light strokes without definitive lines and may be kept hidden when you wear your shoes. 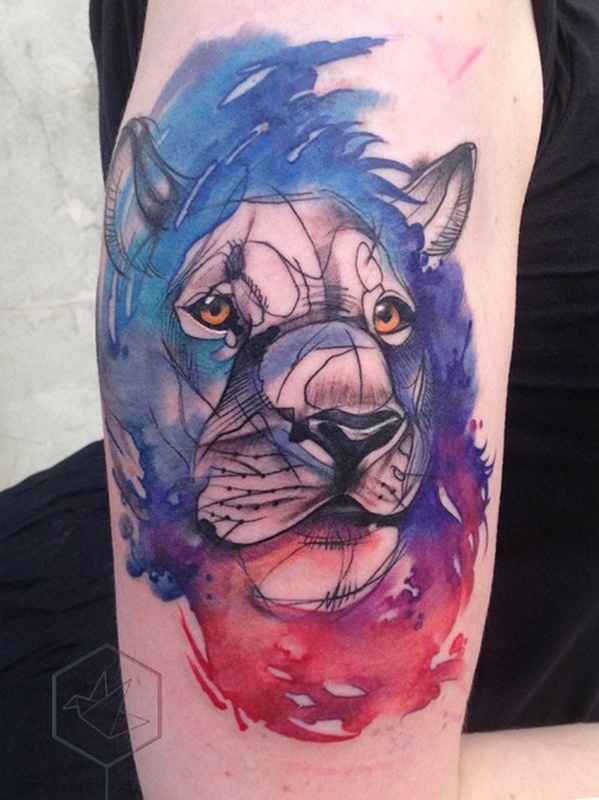 This tattooing style simulates the color palette and brushstroke appeal of watercolor paintings. 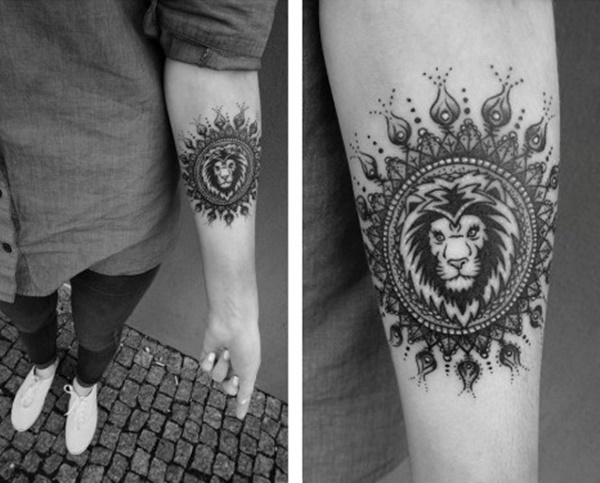 A fantastic lion tattoo for creative and free-spirited persons! 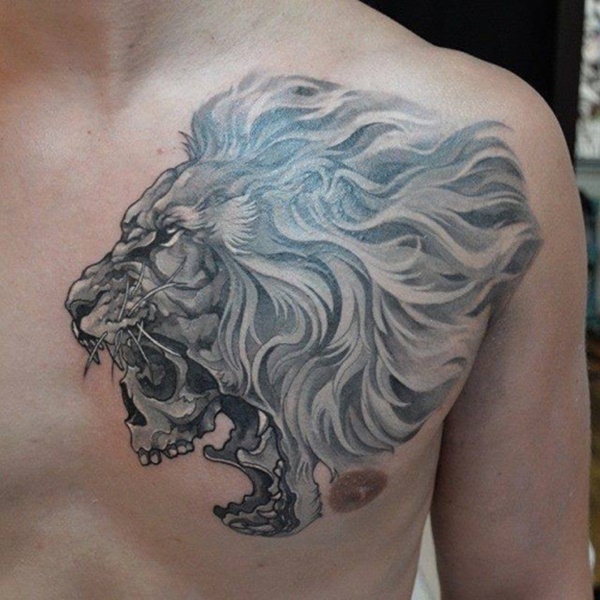 Having a tattoo on the chest is very popular among men, as it signifies dominance and superiority. 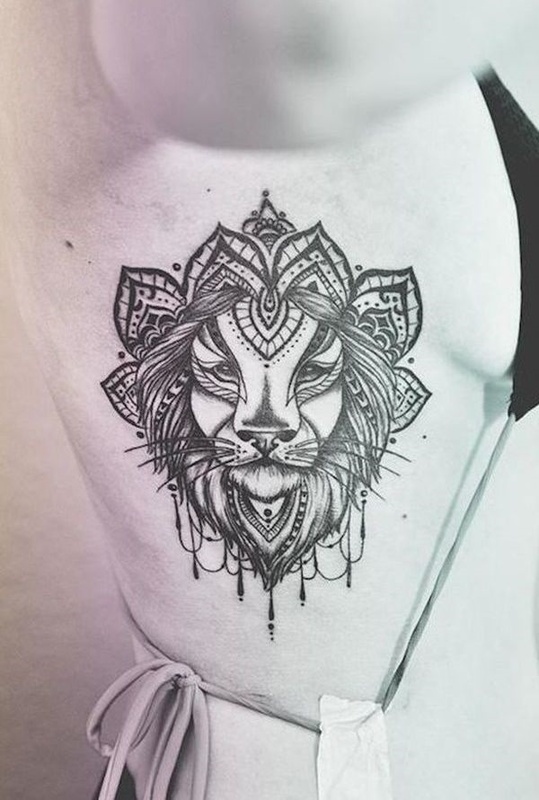 Featuring clearly defined lines mixed with subtle geometric shapes and pieces of braids, this lion tattoo is a wonderful depiction of the magnificent king of the jungle. At first glance, you’ll immediately get the impression that this man has gone through hard times and has overcome life’s challenges. 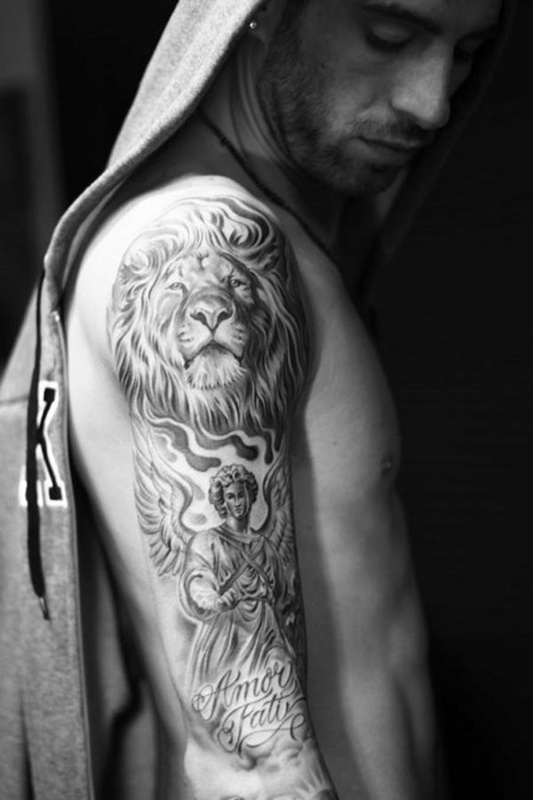 The powerful phrase “Stay Strong” carved over an unrelenting lion emphasizes the will and determination of this person. 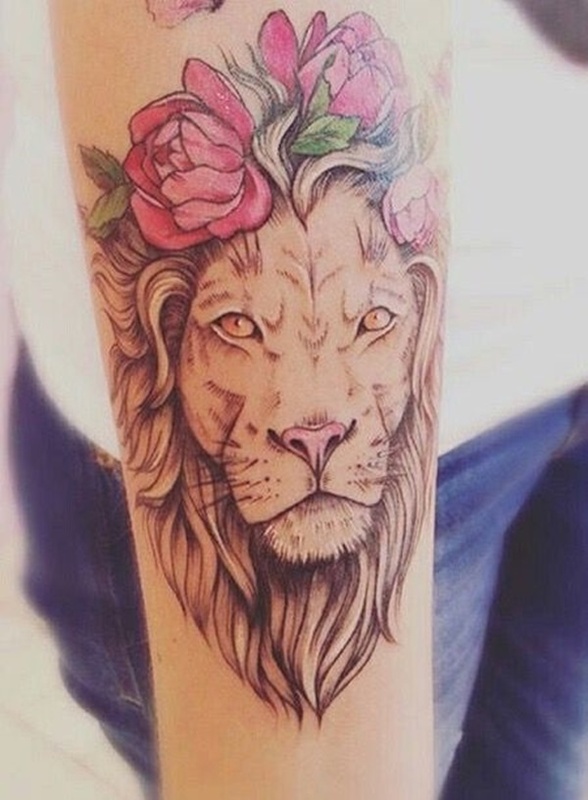 There’s probably nothing more alluring than a strong, independent woman who shows that she’s capable of being fierce and brave like a lion. 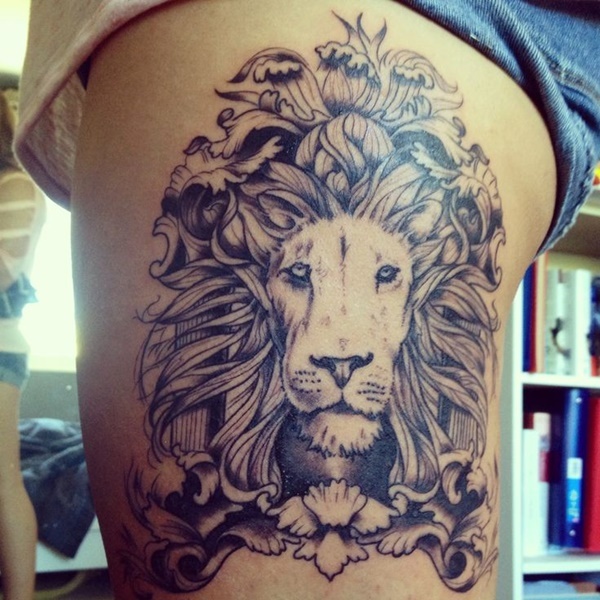 This is another thigh tattoo that shows off an elegant portrayal of the lion. 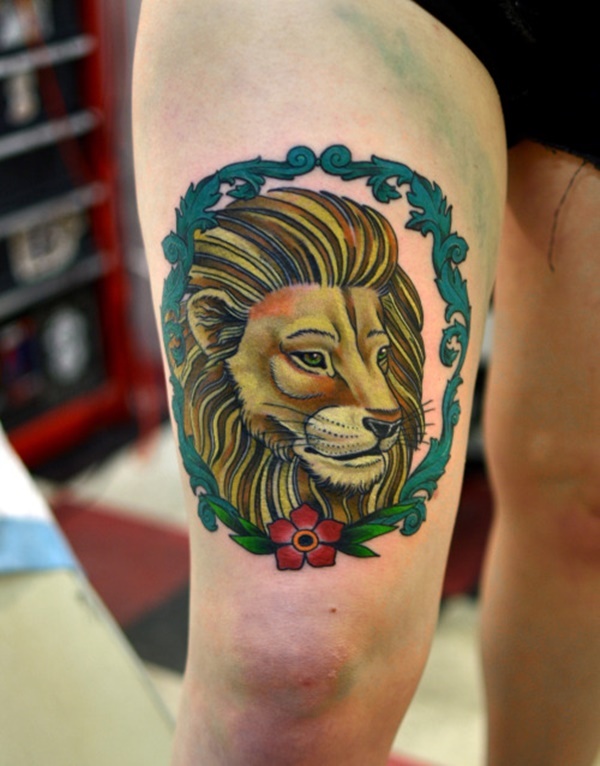 Green leaves surround the central tattoo and converge with a simple, red flower at the bottom. 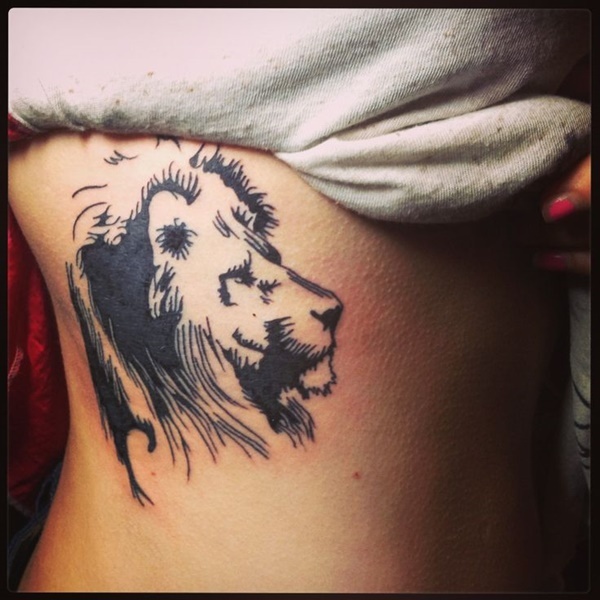 A front-facing lion is emphasized by open-ended outlines and shades of black with the mane mostly left unfilled. 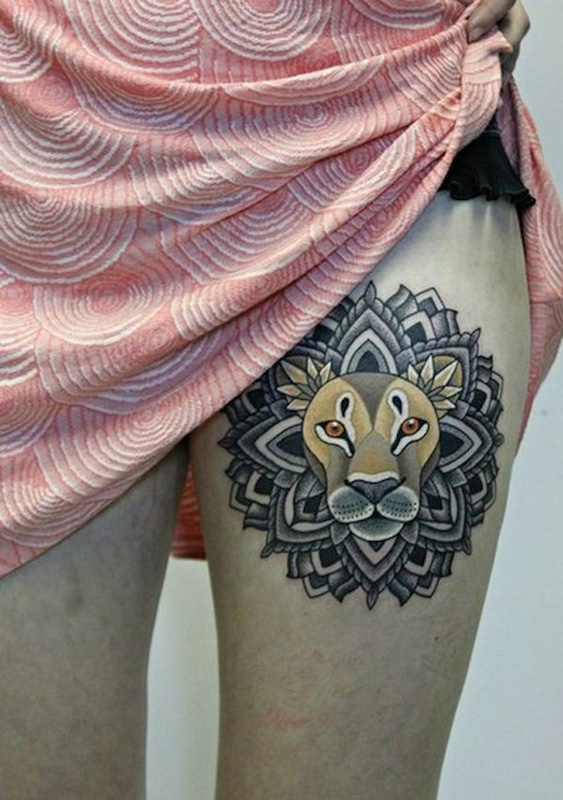 Like a thigh tattoo, a hip tattoo is equally alluring. 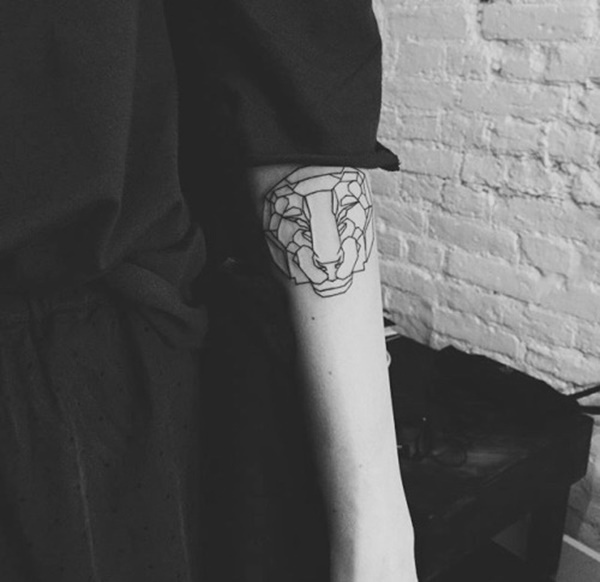 This simple illustration of a lion conveys a woman’s inner strength. 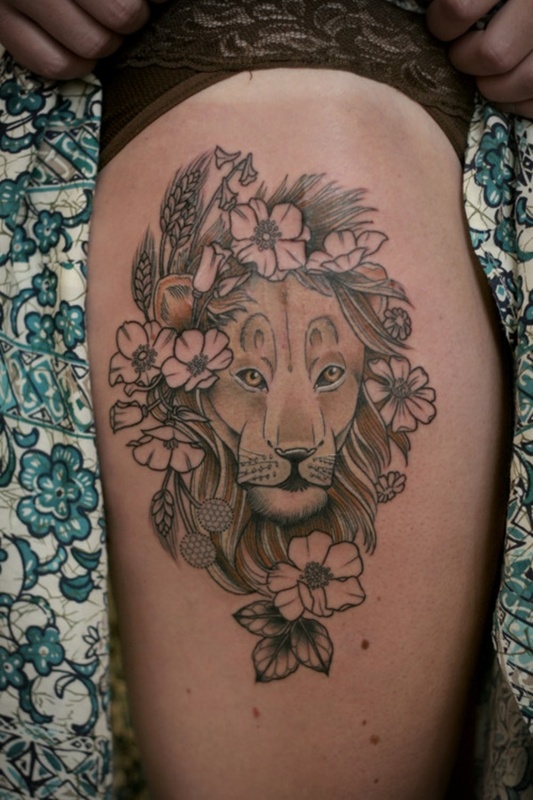 This floral tattoo is perfect for any woman who wants to express her wild and feminine side. 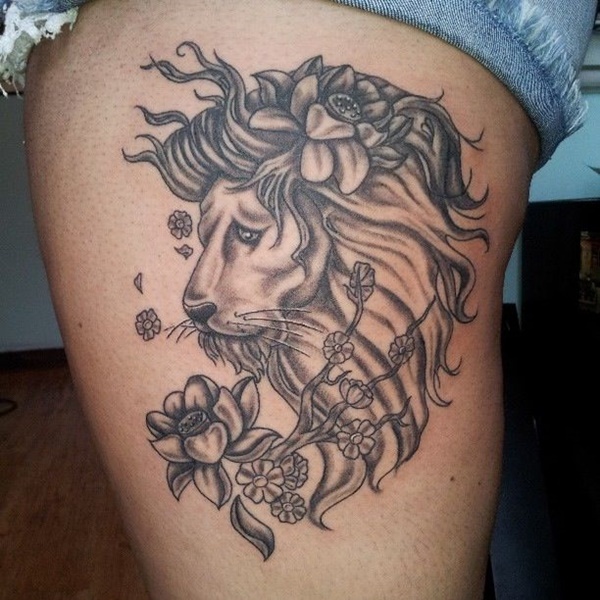 The addition of flowers and leaves makes this lion tattoo more alluring. 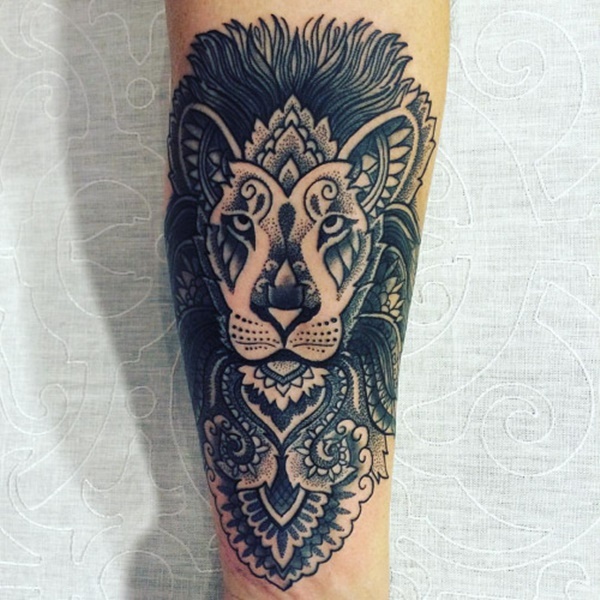 This mandala tattoo emanates radial balance and displays a domineering lion in the center. 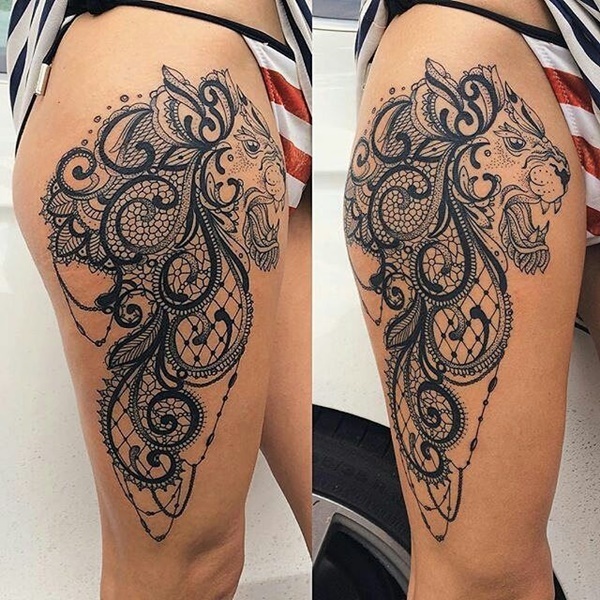 Thigh tattoos appear to be a popular option among women, but this one shows off a peculiar lion with seemingly two tongues that connect to the surrounding exterior outline. 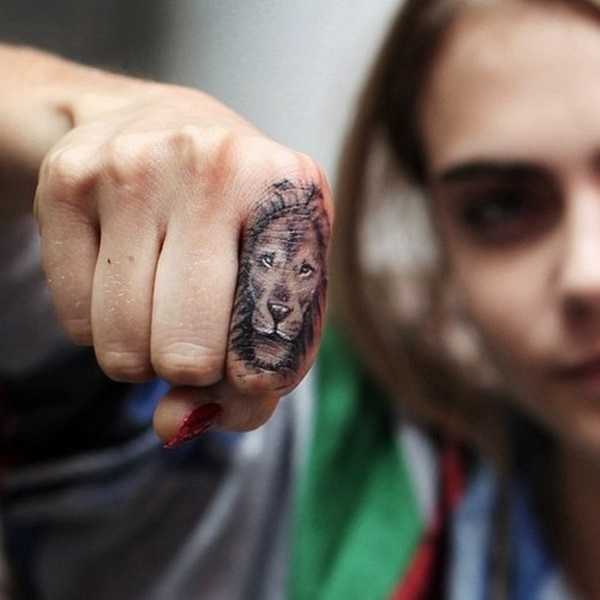 The lovely, world-renowned model and actress Cara Delevingne shows off a lion tattoo on her forefinger. 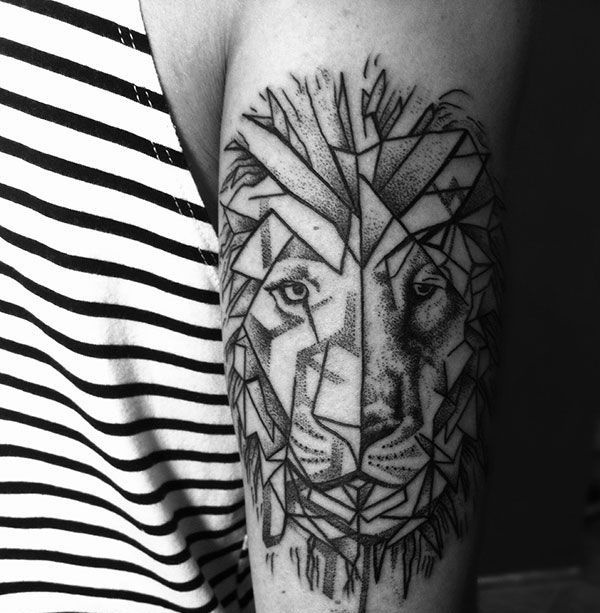 This upper arm tattoo makes use of various geometric shapes and lines that beautifully form a well-balanced design. 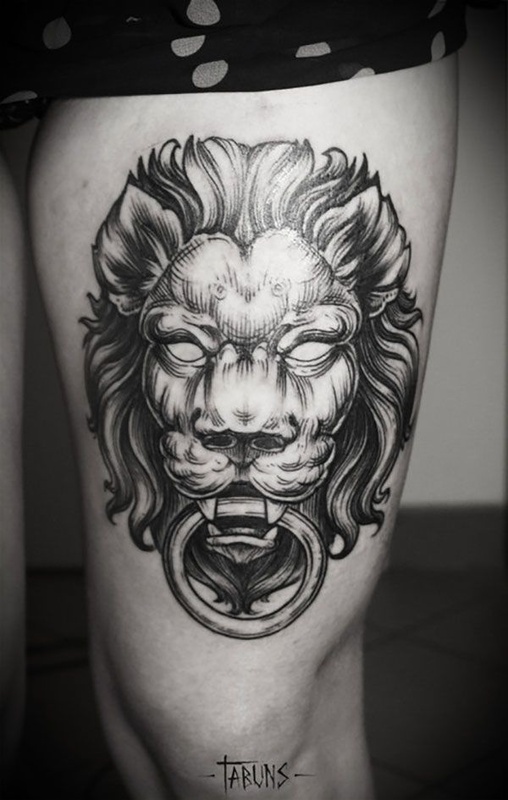 Do you think this tattoo somehow resembles the mythological villain Medusa? The mane of this lion consists of intricate curls and twists, and the head rests on a mysterious circle with dotted lines inside and an arrow in the middle. 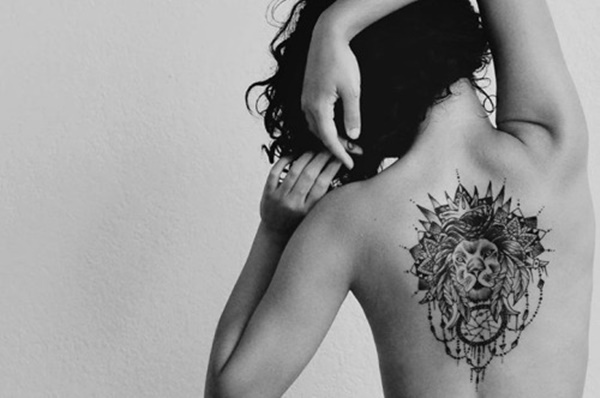 This back tattoo exudes a regal charm that’s perfect for strong, independent women. 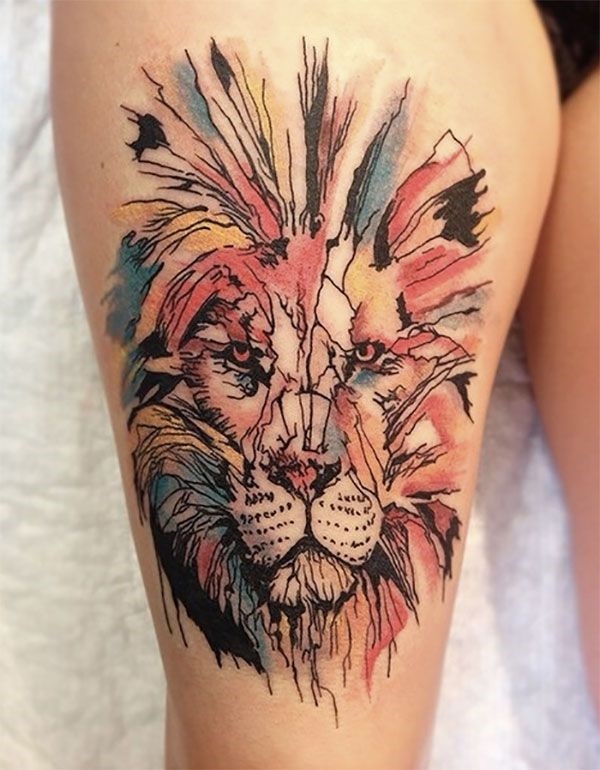 If you’re looking for a dash of creativity, this watercolor tattoo embodies an artistic motif that everyone around you will surely admire. 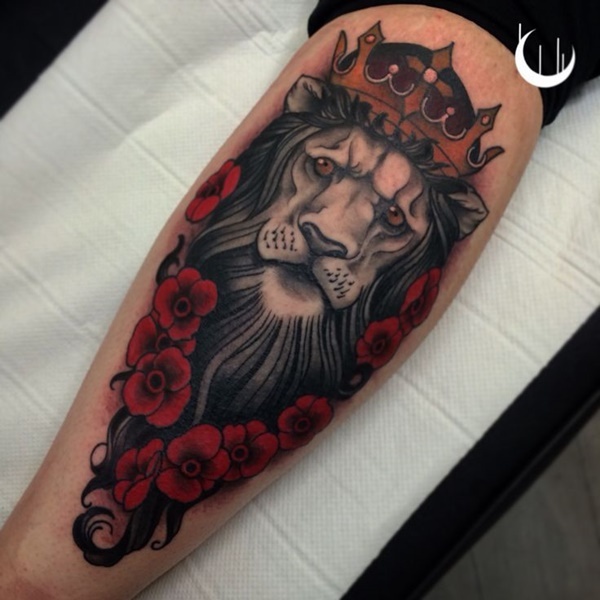 As the king of the jungle, a lion certainly deserves a crown, and this tattoo captures the authoritative presence of a lion. This 3-D artwork looks eye-popping and grabs anyone’s attention. 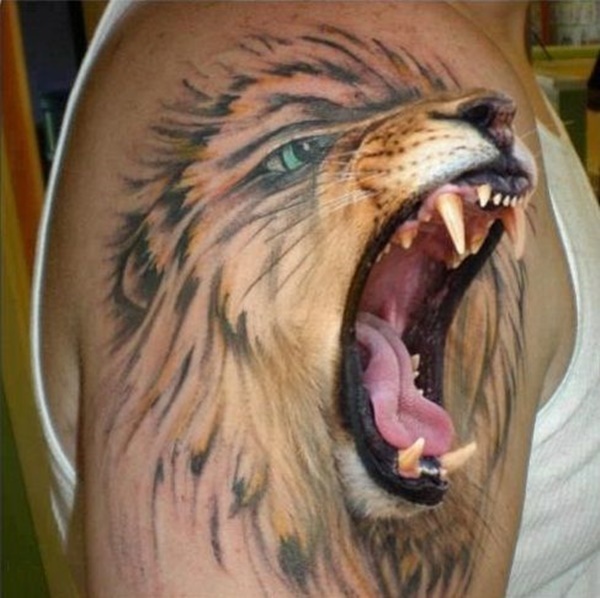 It practically looks like the lion is roaring out of the man’s arm! 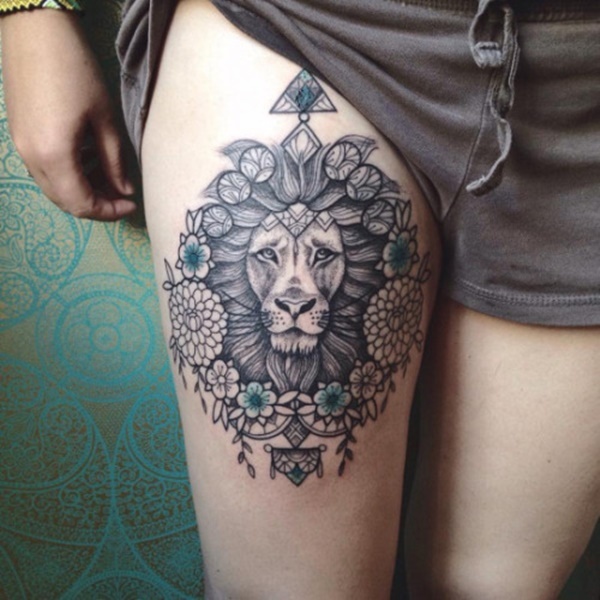 The floral design of this tattoo adds a hint of feminism to its overall look. 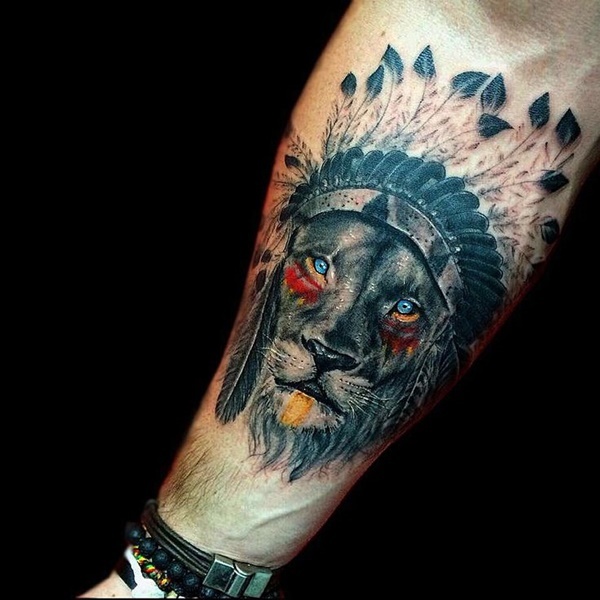 Tribal leaders in the old times, and even in the present times, considered the image of lions as a sign of leadership and power. 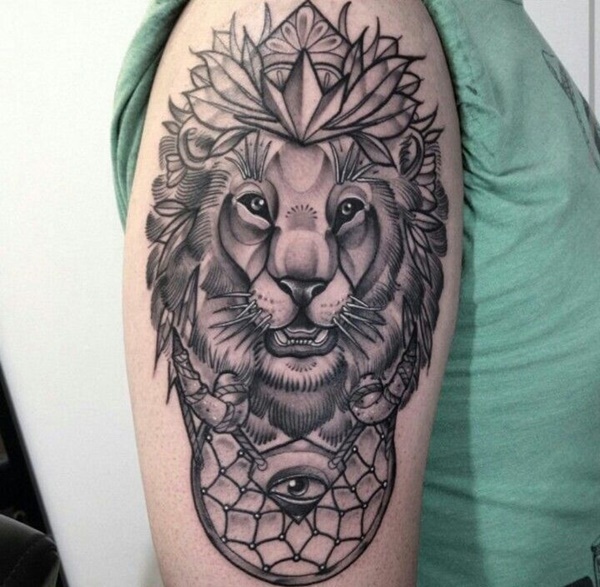 This tattoo boasts a perfectly geometrical style and also looks mysterious with the addition of an eye. 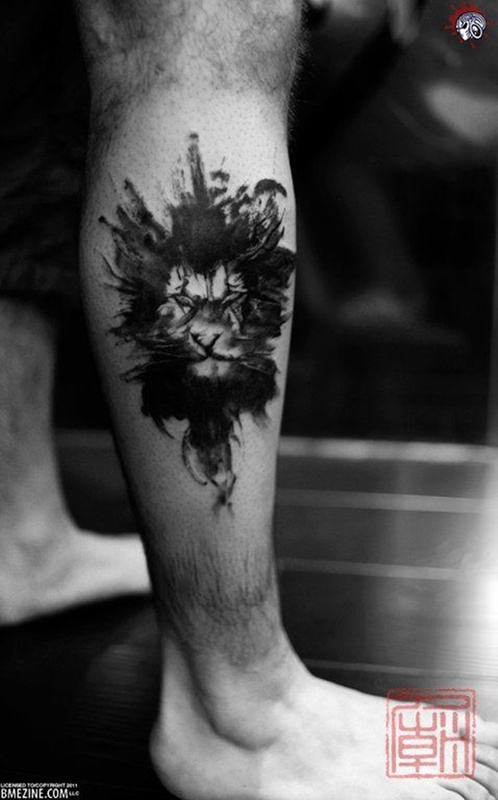 Showcasing the magnificence of a roaring lion, this tattoo transforms the man’s arm into an exquisite work of art. 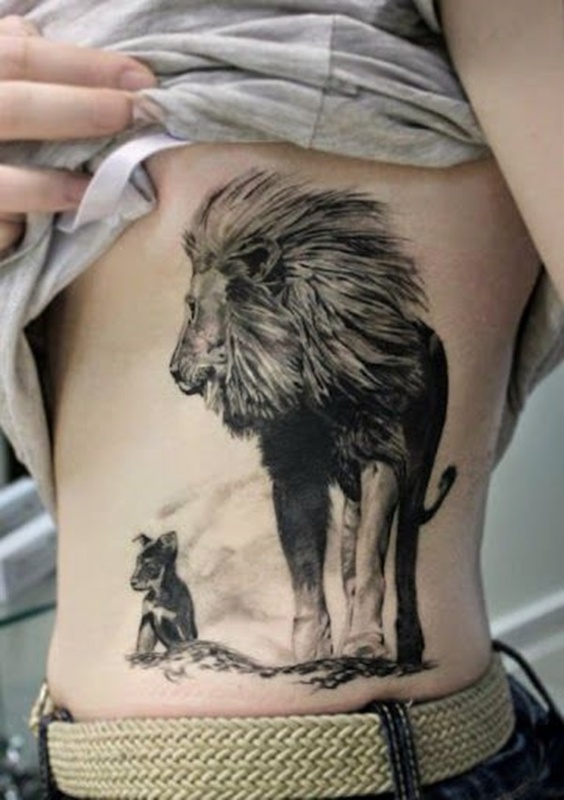 The lion walks side by side with a dog, making this tattoo extremely charming and lighthearted. 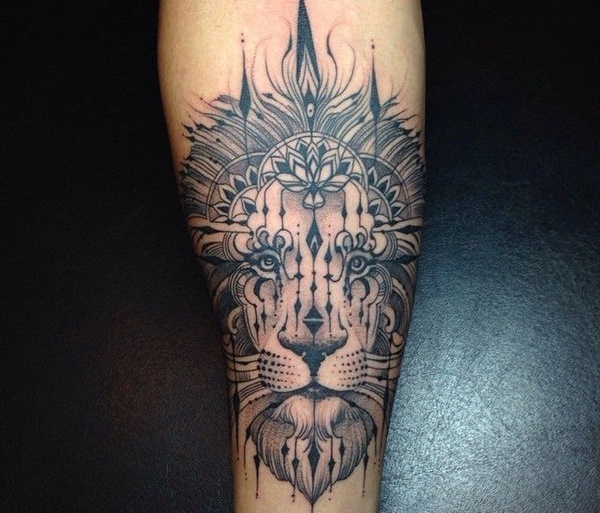 This tattoo appears nothing short of majestic, with its flowy outlines and curvy style. 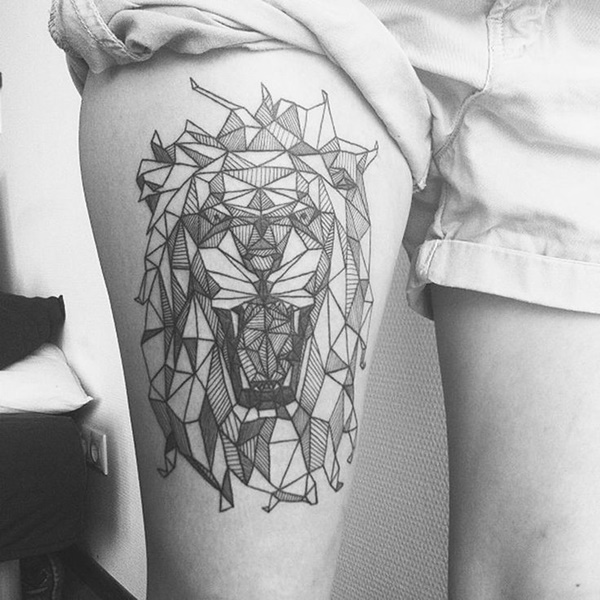 This attractive tattoo creates a distinctive geometric pattern that looks meticulously inked. 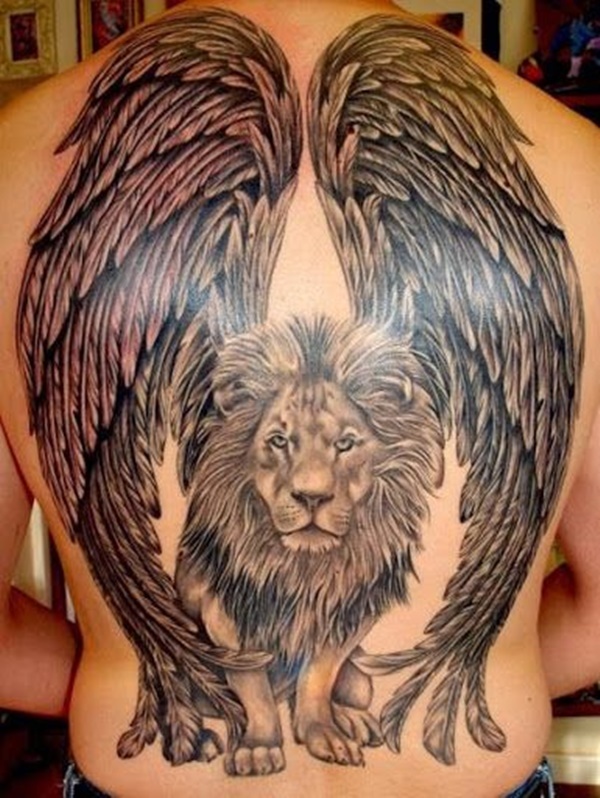 This winged lion tattoo is a wonderful expression of freedom for the free-spirited individual. 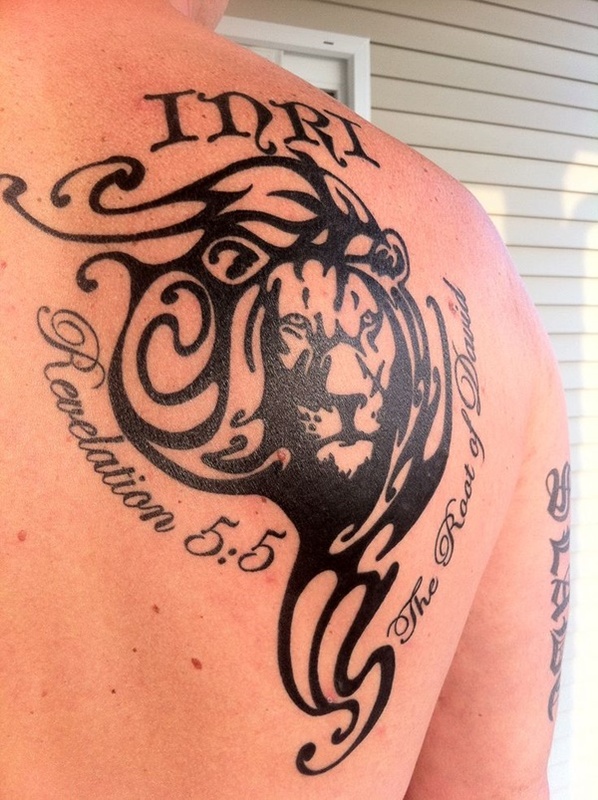 Conveying religious hints, this tattoo is very symbolic and meaningful. 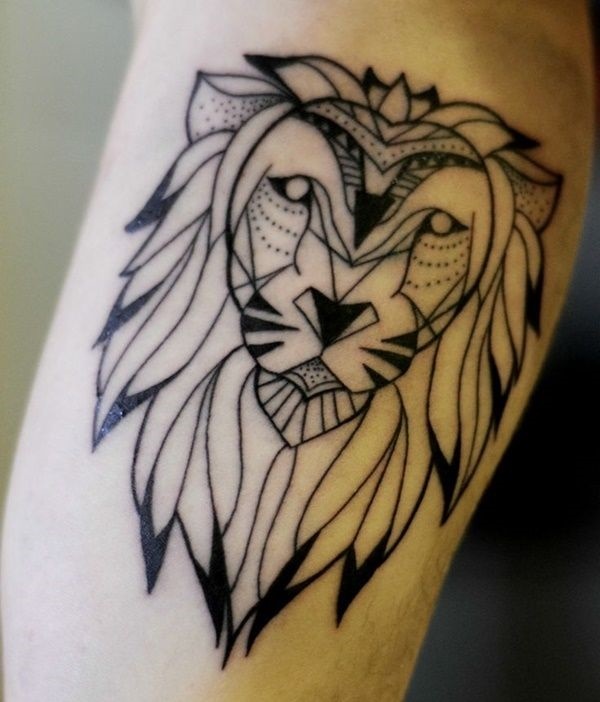 While this tattoo is devoid of heavy shades, the proportional lines create a symmetrical design that looks attractive. 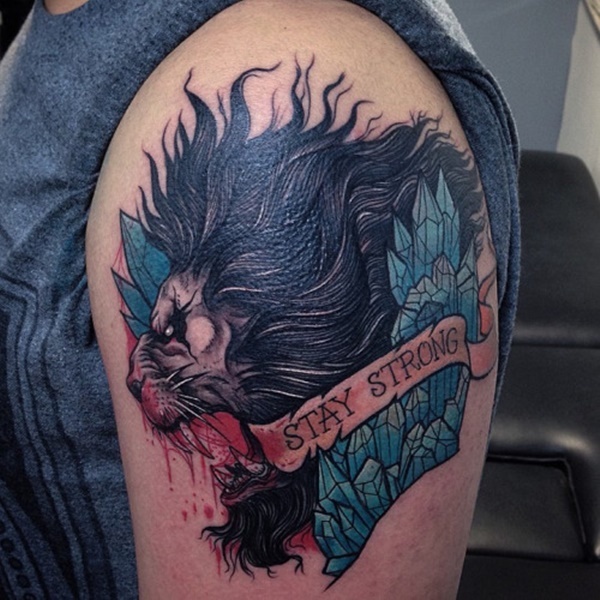 Hints of yellow, red and blue hues add a jolt of color to this black and gray tattoo. 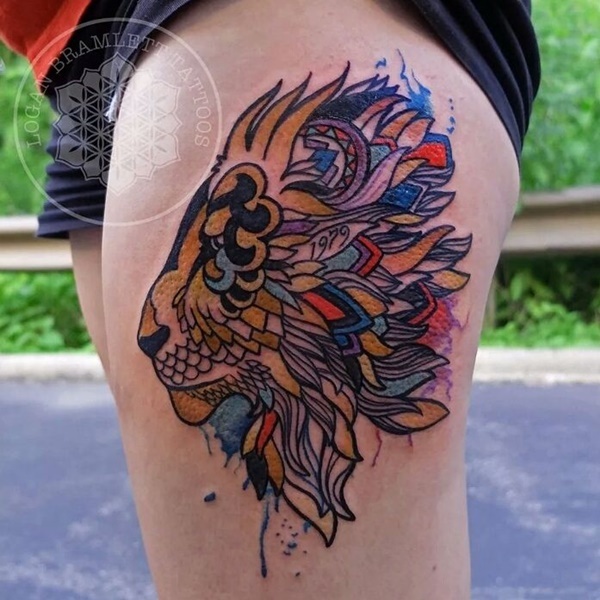 Nothing says “living life without worries” better than this creative tattoo, in which the words “Hakuna Matata” form the shape of a lion. 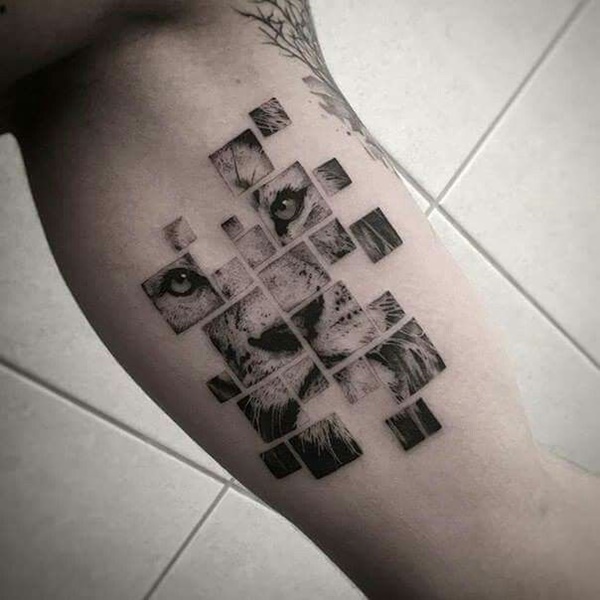 Like putting different pieces of a puzzle together, this mysterious tattoo features separate blocks that form the face of a lion. 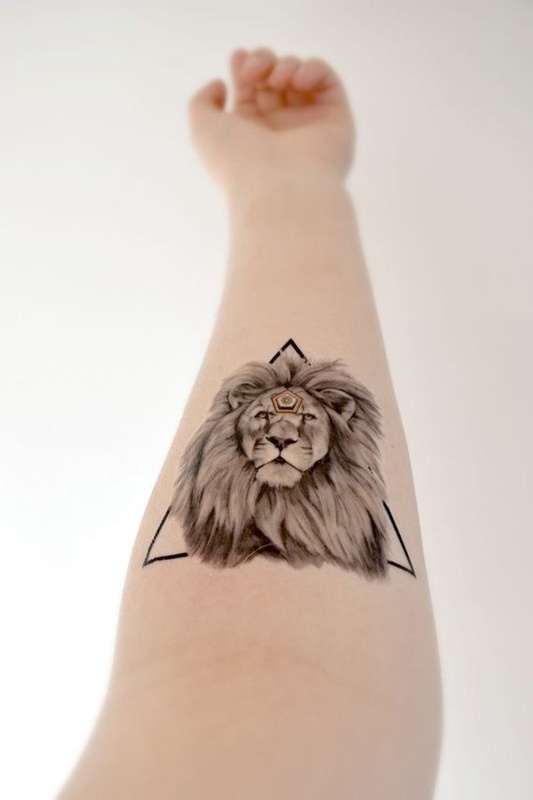 Geometrical tattoos always look fascinating, with their distinctive composition and sense of balance. 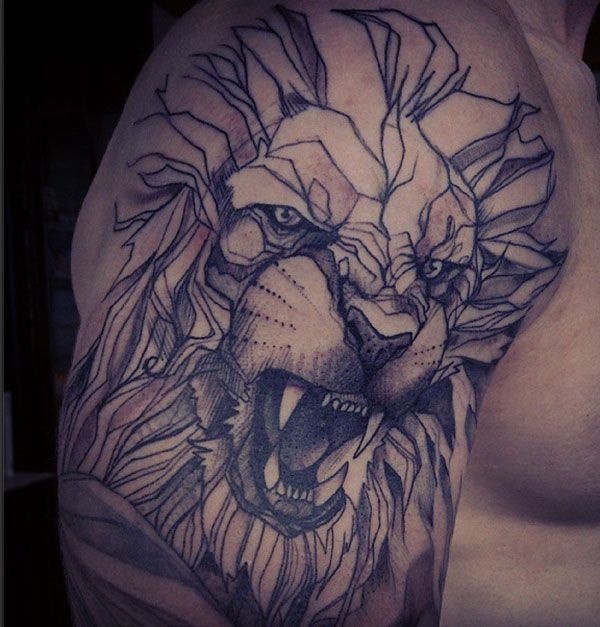 This lion tattoo shows your dominance and power. 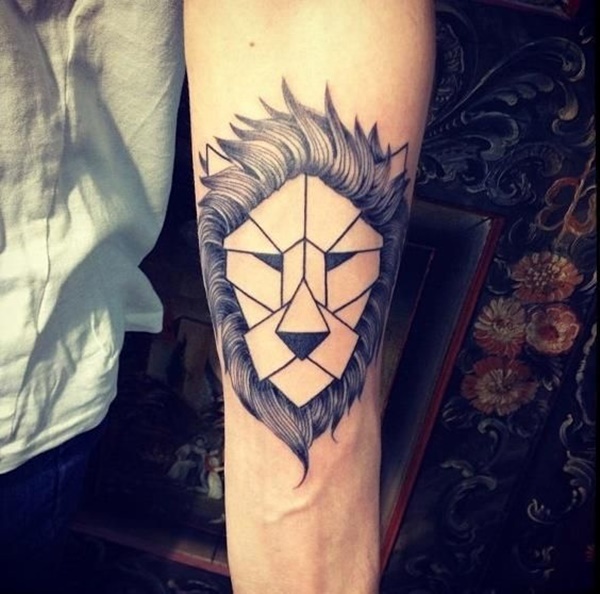 As simplistic as it looks, this tattoo boasts a streamlined design that’s ideal for anyone who doesn’t like tattoos that are too bold and showy. Do you believe that each of us has two faces, one of which we openly show to the world and the other more concealed? 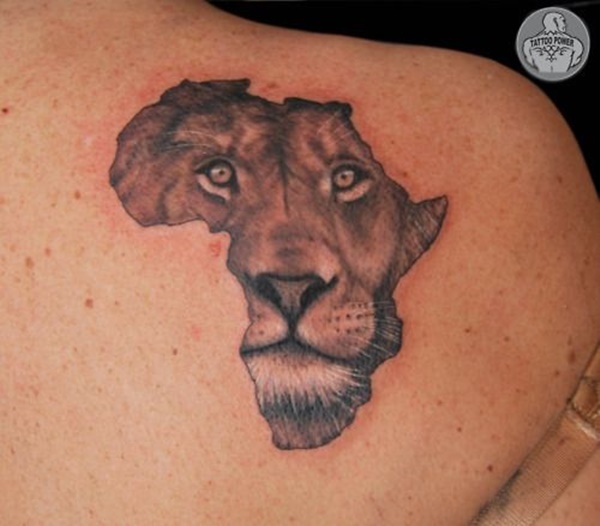 This meaningful tattoo conveys that message and will surely get you thinking. 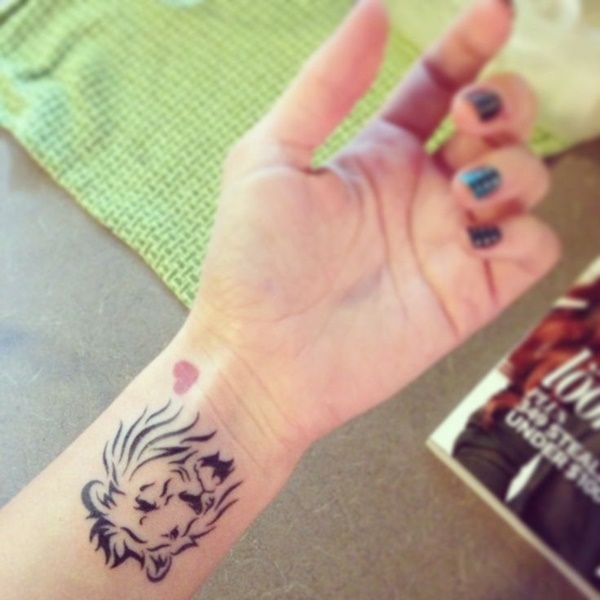 This small, subtle tattoo covers only a small portion of your wrist and thus doesn’t look gaudy. 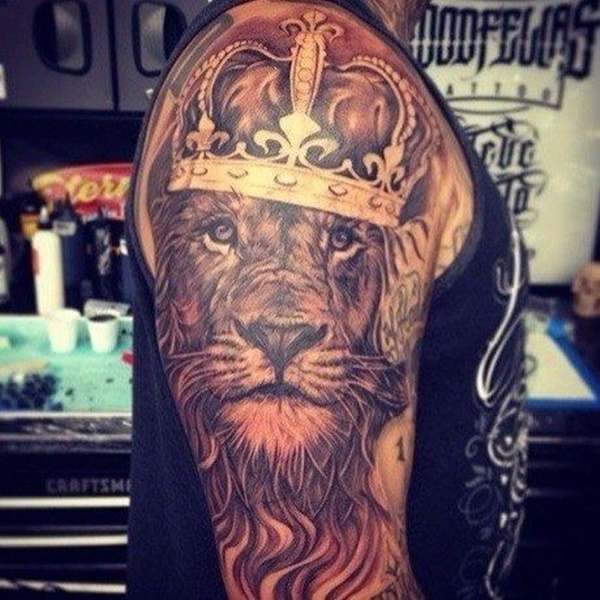 When you choose to cover your entire arm with a sleeve tattoo, you can never go wrong with an outstanding design like this regal lion tattoo. 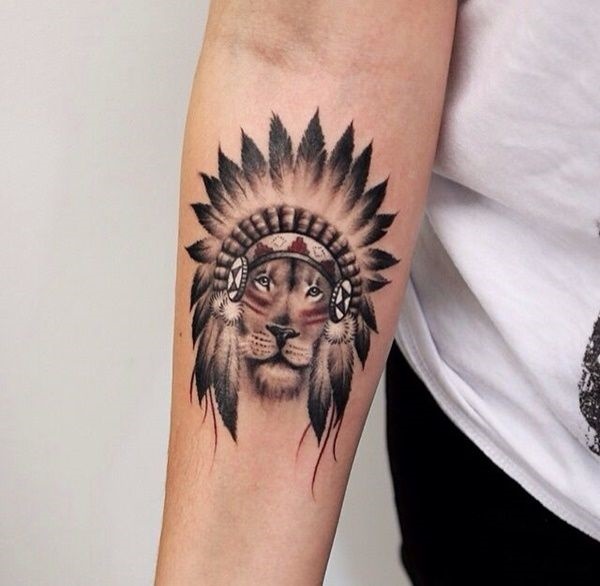 This tribal tattoo expresses authority, power, and dominance. 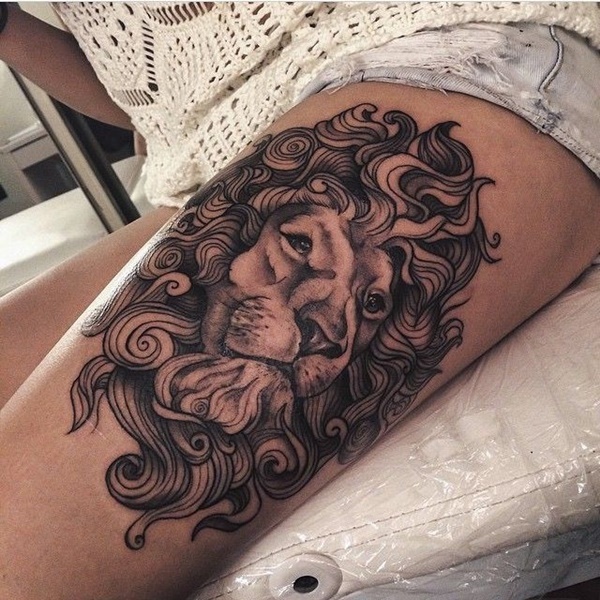 While a lion typically looks menacing, this tattoo tones down the animal’s scary image and transforms the lion into a charming creature. 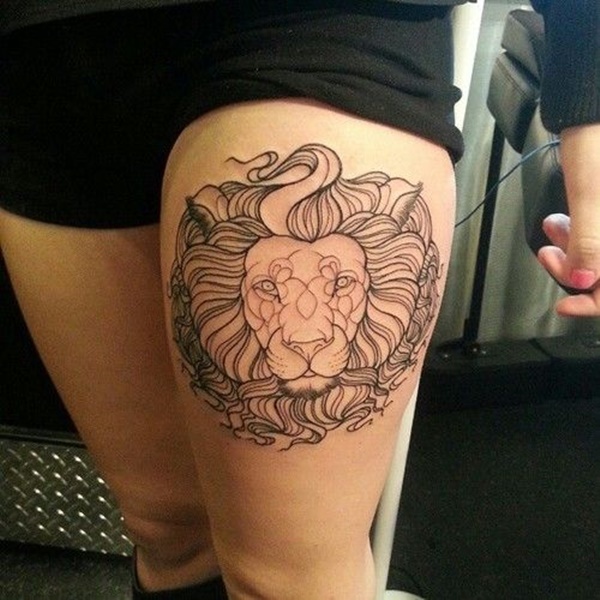 This thigh tattoo adds appeal and makes the woman more enticing than ever. 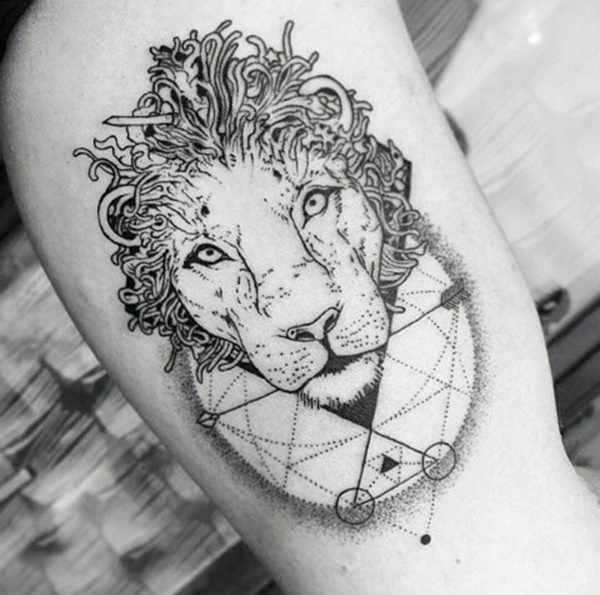 The soulful eyes of a lion say a lot, and this tattoo captures the brooding look of a wise lion perfectly. This flank tattoo is inevitably hidden when you wear a shirt, but it’s perfect to display when you’re out in the beach or having fun outdoors. 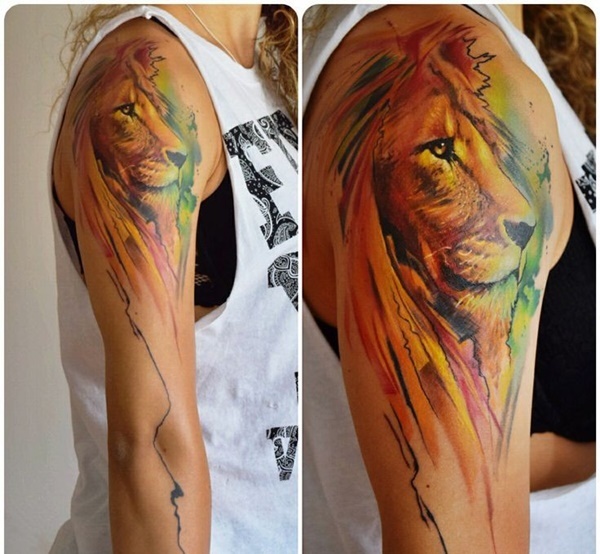 Like the previous watercolor painting tattoos shown above, this colorful tattoo is brimming with creativity and interest. 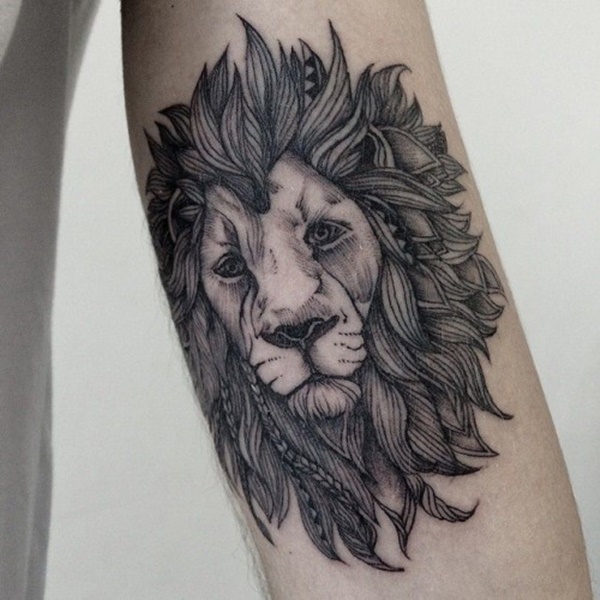 The Latin phrase “Amor Fati” means “love of fate,” making this tattoo a symbolic representation of the person’s belief in accepting everything that happens in his life. 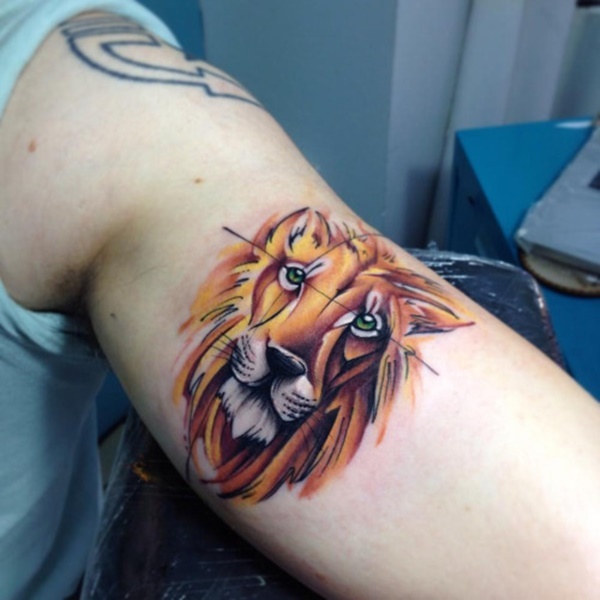 The gloomy eyes of the lion on this tattoo express a certain melancholy that touches the heart. 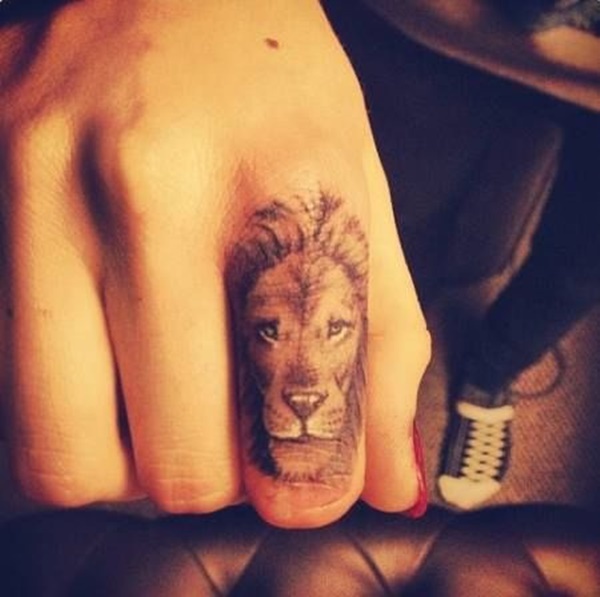 This forefinger tattoo belongs to none other than the ultra-famous model-actress Cara Delevingne, who’s best known for her playful, carefree personality. 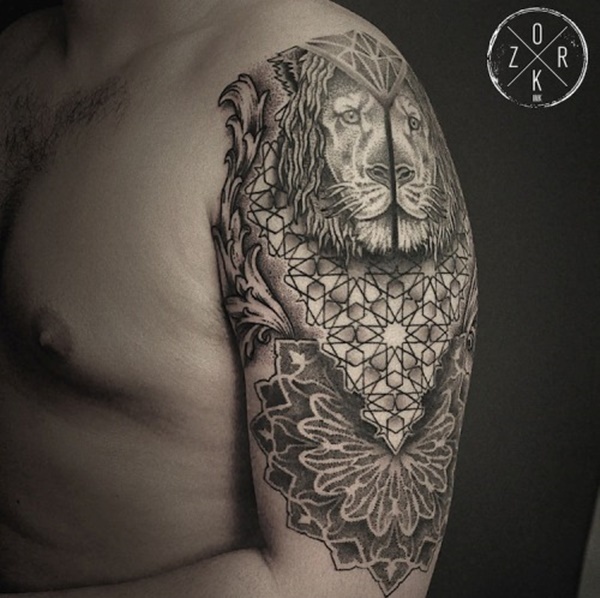 This Mandala tattoo is an excellent portrayal of proportion and symmetry. 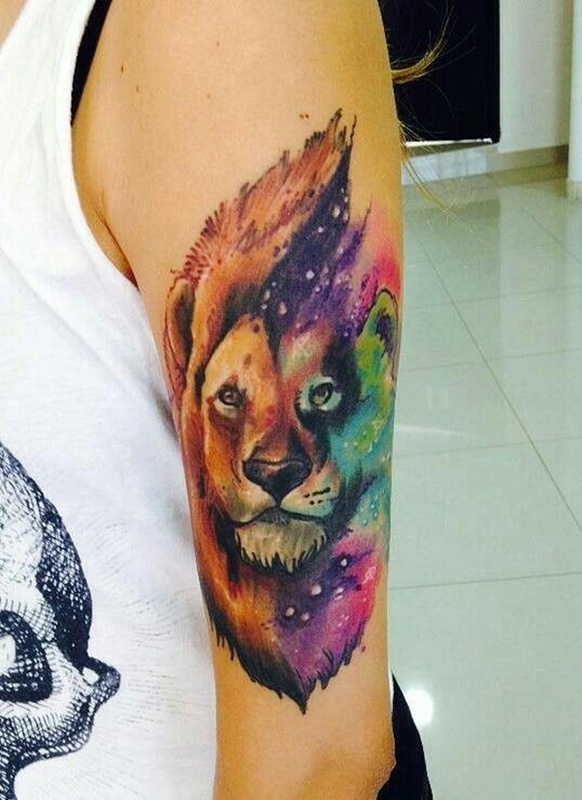 This colorful tattoo is simply eye-catching. 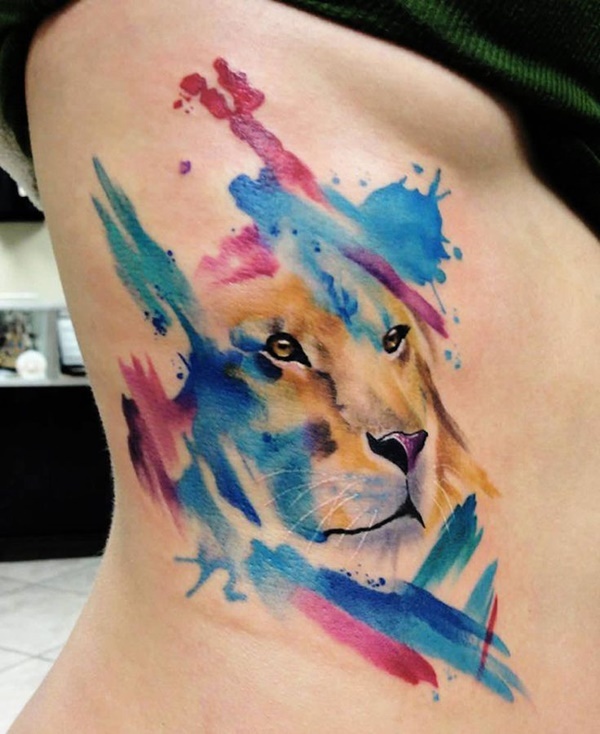 It seems that many of these lion tattoos are watercolor painting types, and for a good reason. 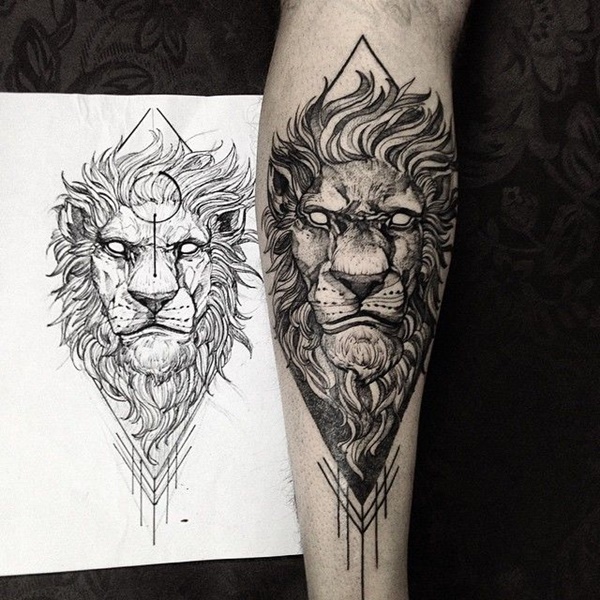 This tattoo design never goes out of style. 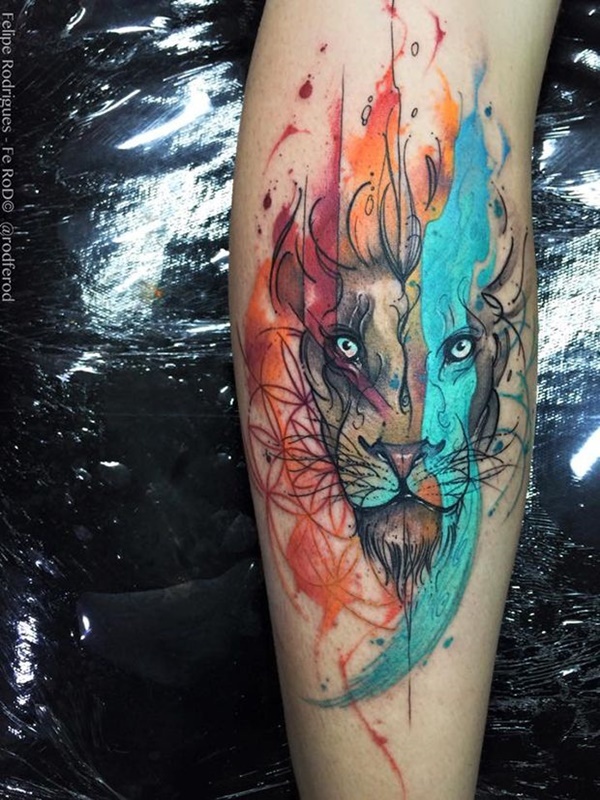 Vibrant shades of blue, orange, red, and black characterize the mesmerizing design of this tattoo. 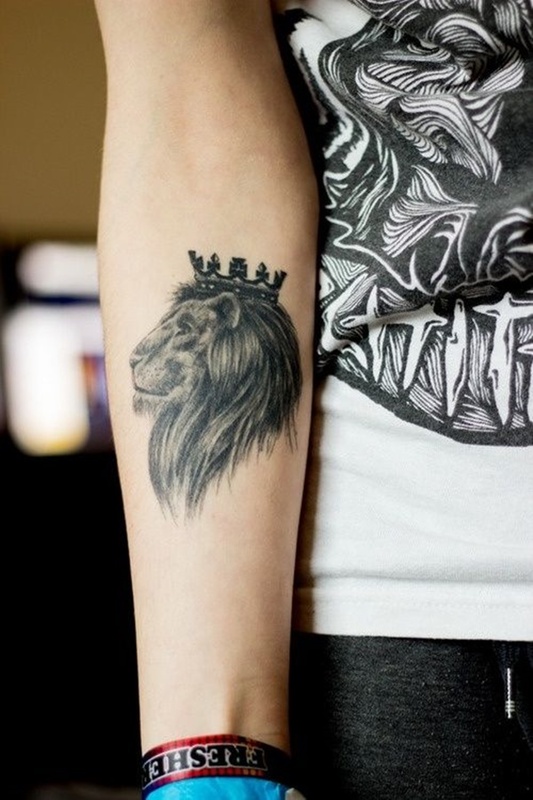 This person’s wrist displays a simple lion tattoo that’s suitable for youngsters and adults alike. This doesn’t look exactly appealing at first glance, but the coarse lines and simple design may catch your interest. 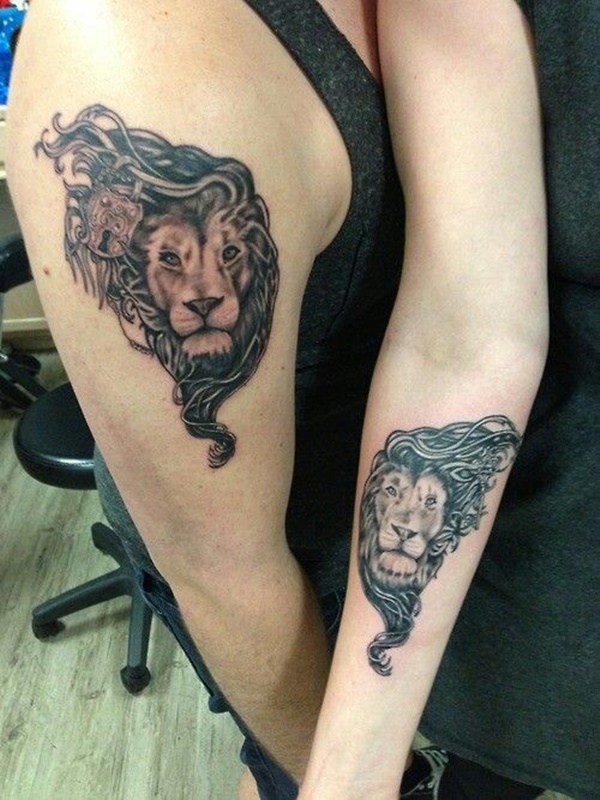 Showcasing dark shading, these matching arm tattoos are perfect for couples. 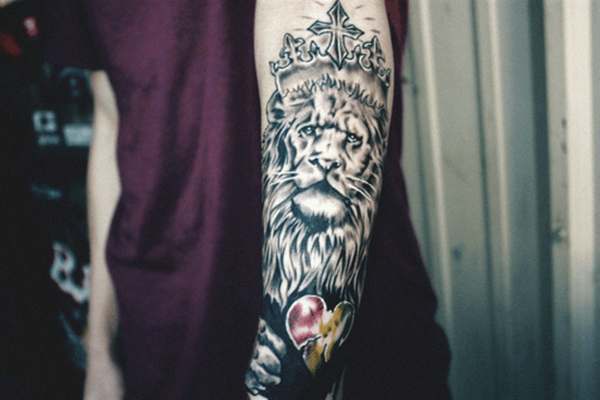 This arm tattoo looks meticulously handcrafted. 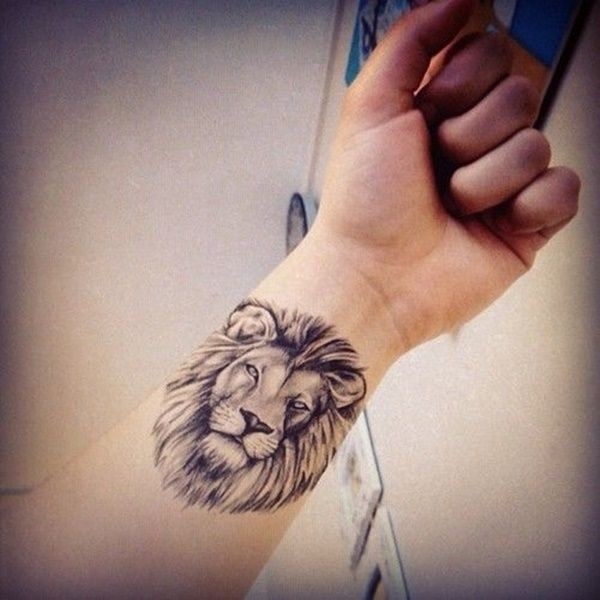 Who said lions are always wild? 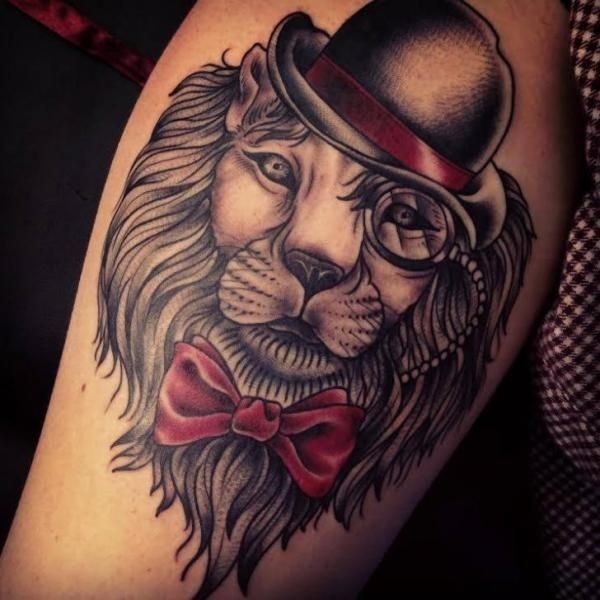 This tattoo adds a touch of refinery by transforming a lion into a sophisticated lad with a hat and bow tie. 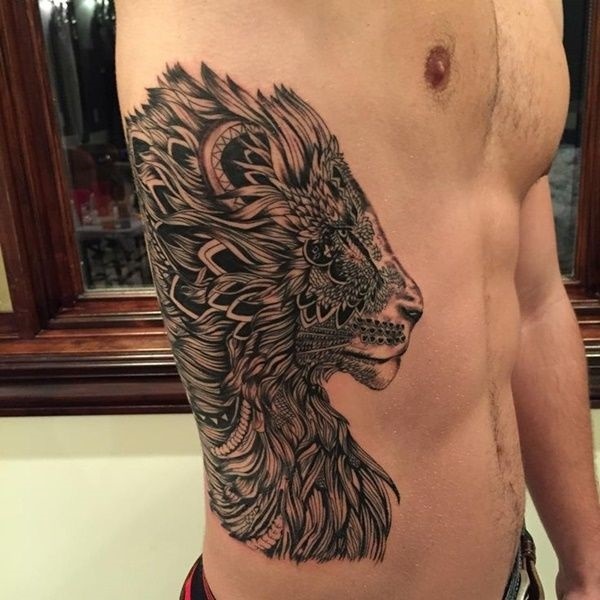 This blurry tattoo looks like a messy blotch at a distance, but shows an artistic splash of dark shades on closer inspection. 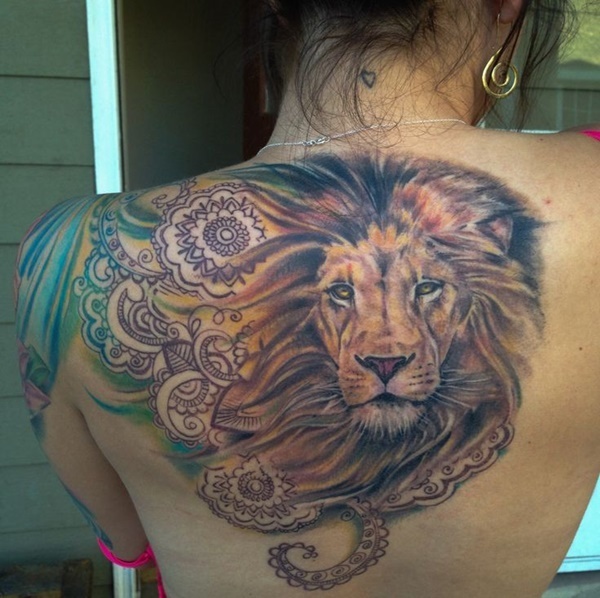 This magnificent tattoo adorns the back and left shoulder of this woman, with interesting geometric designs and distinctive shapes extending from the mane of the lion. 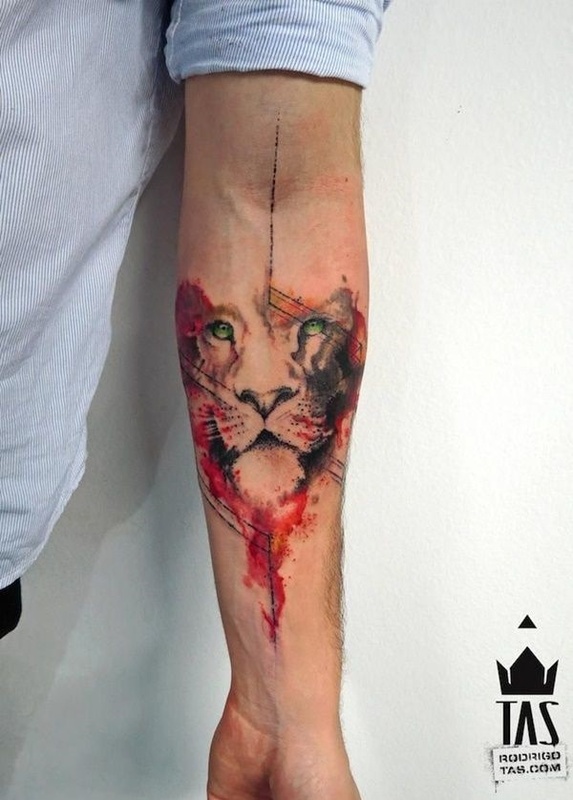 While it looks a bit perplexing, this creative tattoo shows a lion seemingly peeking from the inside of a crack. The mane of this lion appears elegant, as the curls and twirls replace the typical mane. 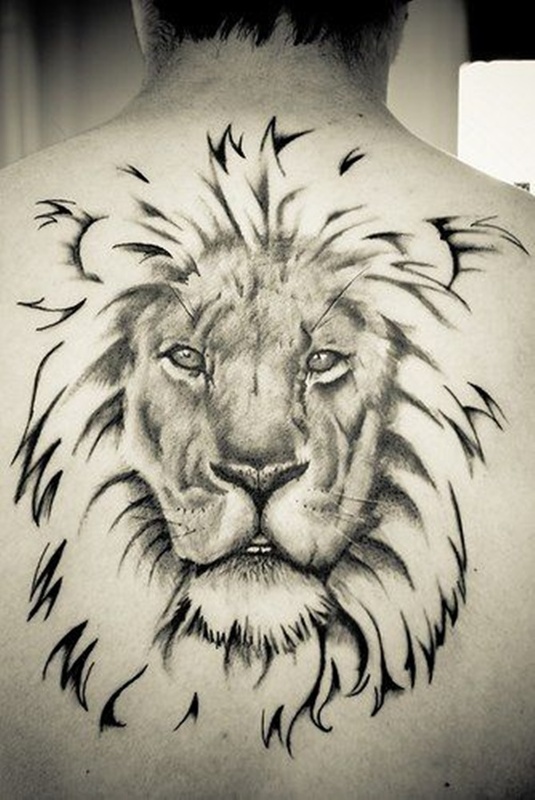 If you really want to boost your manliness and exude an air of power, this tattoo will surely do the job. 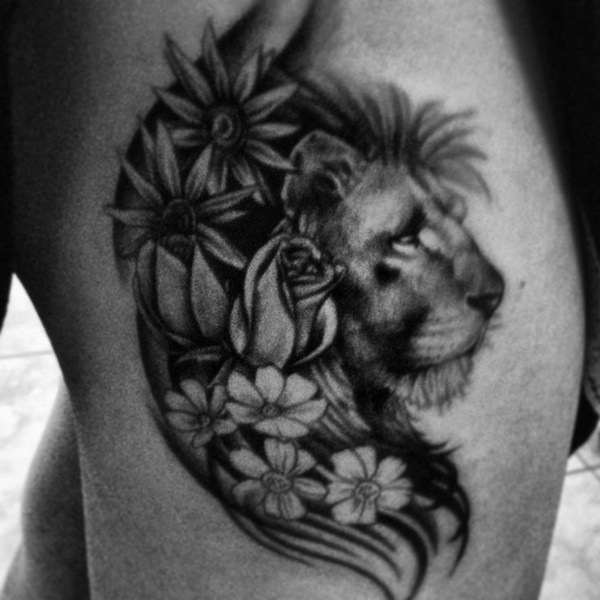 However, the image of a ferocious lion is somehow balanced out with the addition of a flower at the bottom. 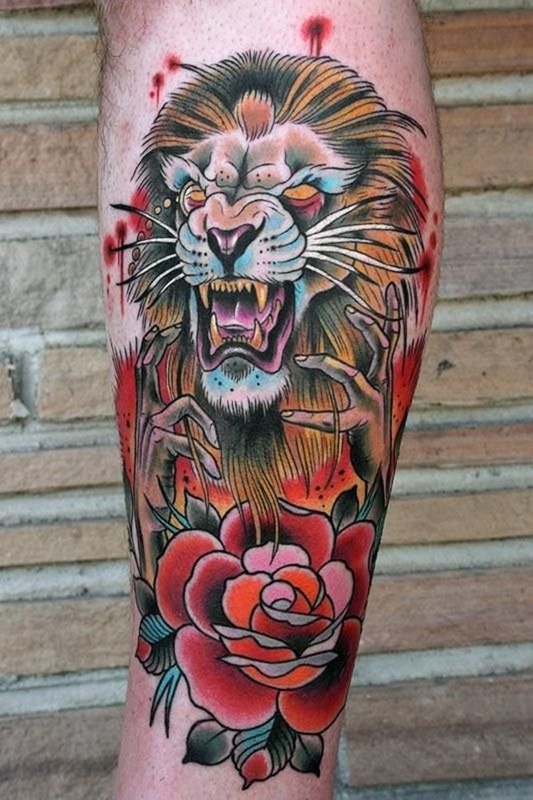 A fantastic tattoo that’s mainly composed of red and orange hues. 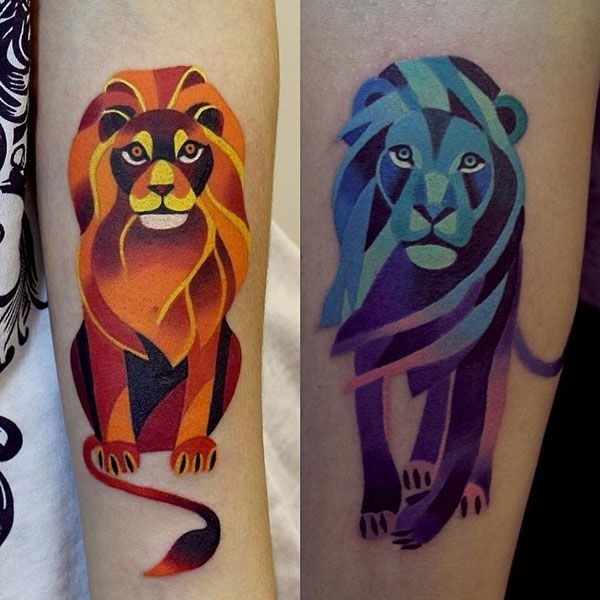 These tattoos excellently depict two contrasting colors, with one lion sitting calmly with a fiery brightness and the other pacing menacingly with blue and purple shades. Definitely an amazing choice for couples. 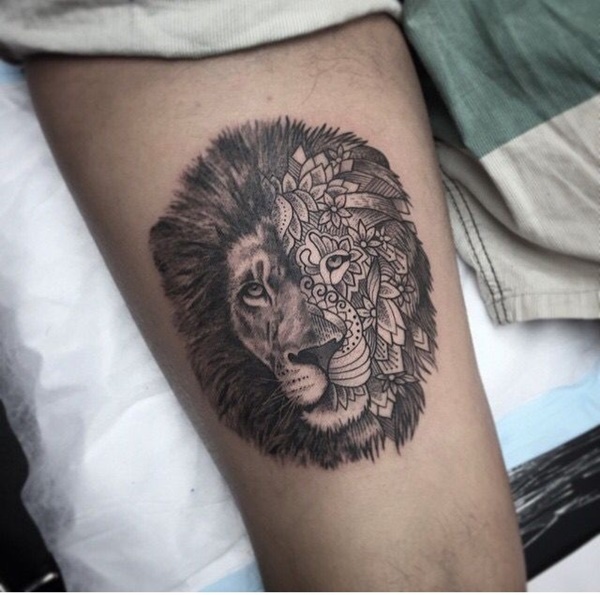 This tattoo at the back of the leg combines black and gray shades. 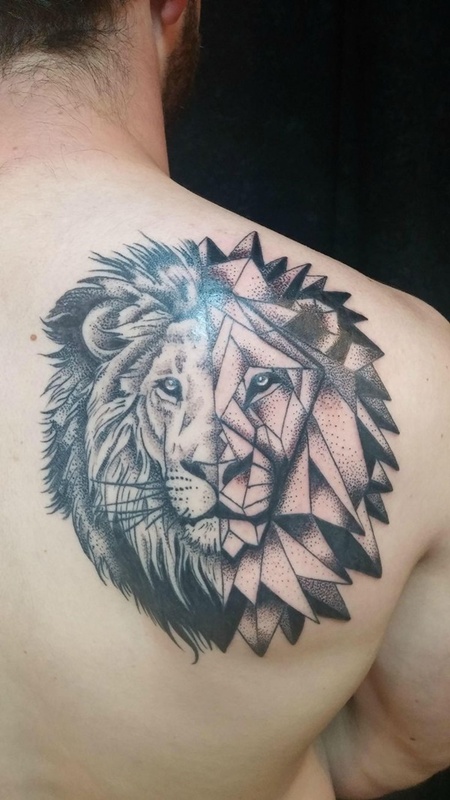 A unique geometrical tattoo that embodies artistic skills. 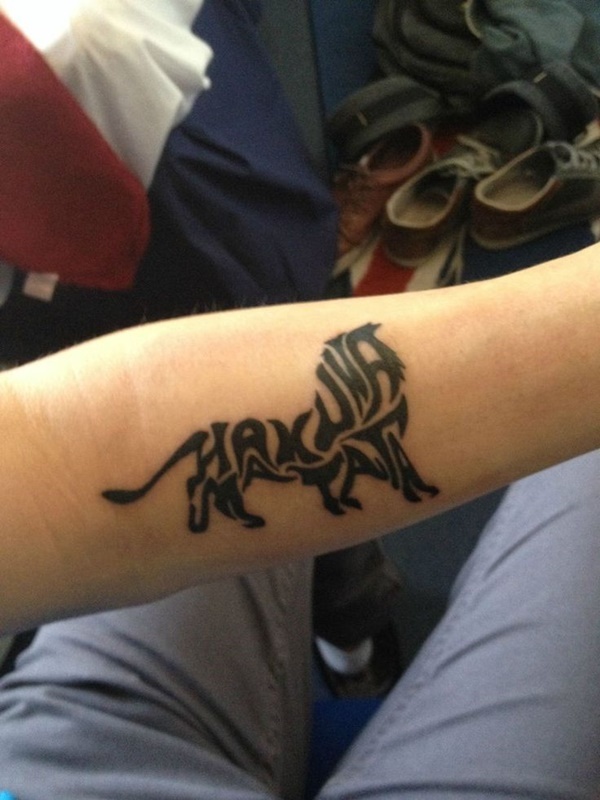 This tattoo has an interesting story to tell. 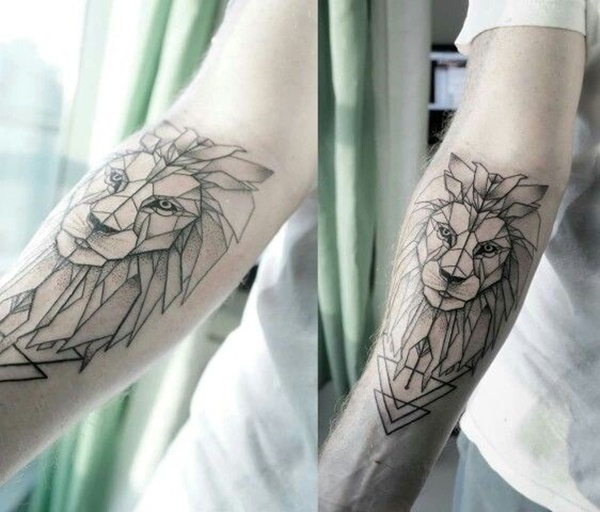 It appears to show conflicting personalities, one of which is a strong-minded lion and the other a delicate damsel in distress. 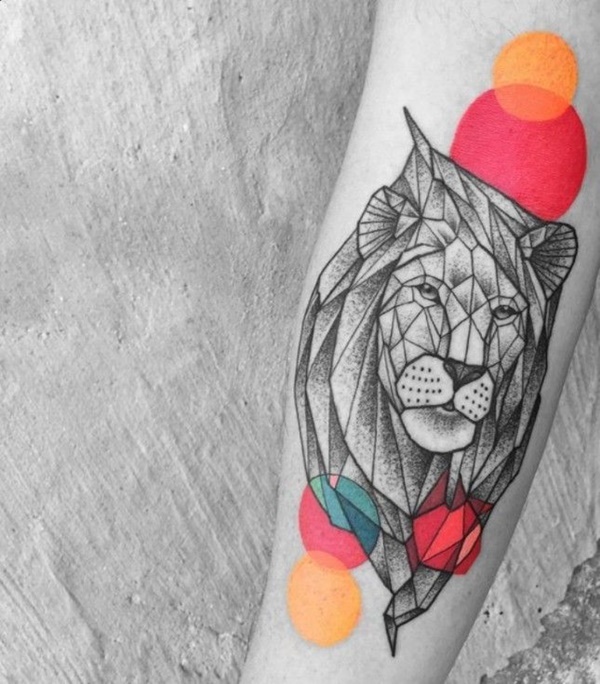 A perfect blend of colors that adds interest to your arm. 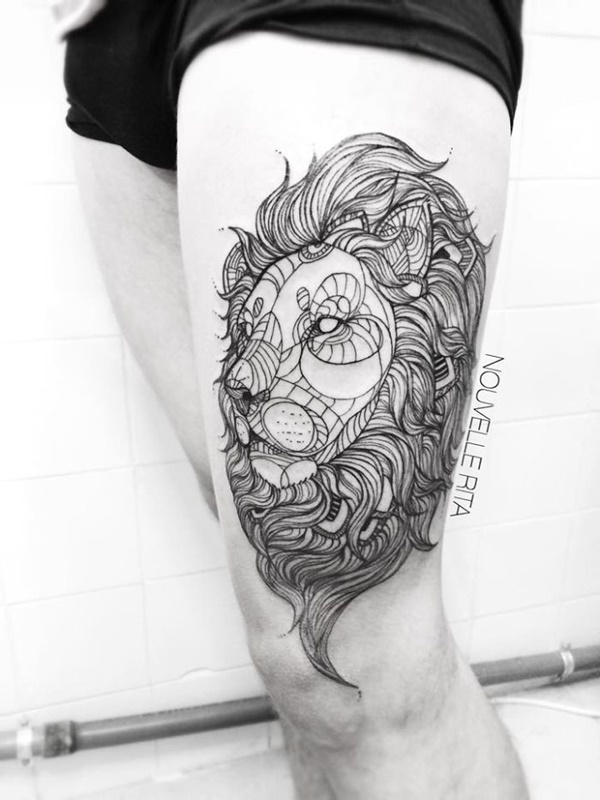 If a floral-themed tattoo is your preference, this lion tattoo showcases a flowery mane that emanates femininity and elegance. Another ideal example of proportion and balance.